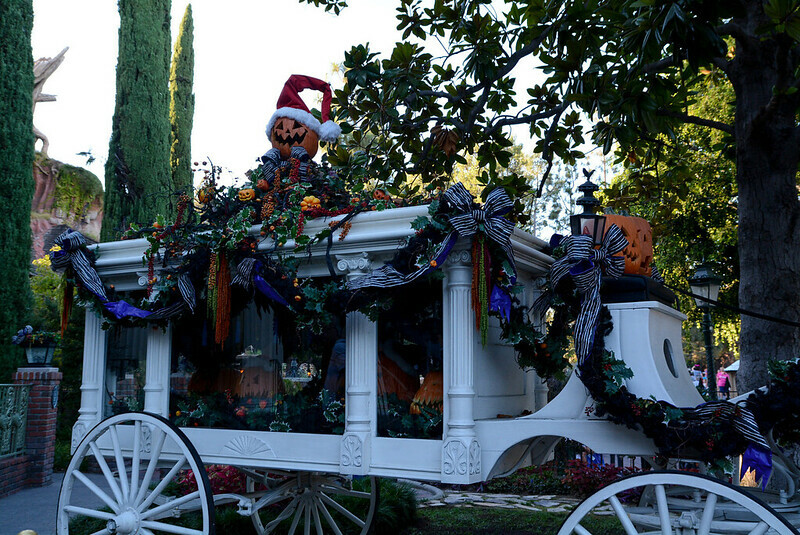 I thought that Mickey's Halloween Party would be the perfect opportunity to visit. The Halloween Party is a special event, and for my date (Tuesday, September 30), the cost of the ticket was $63, tax included. 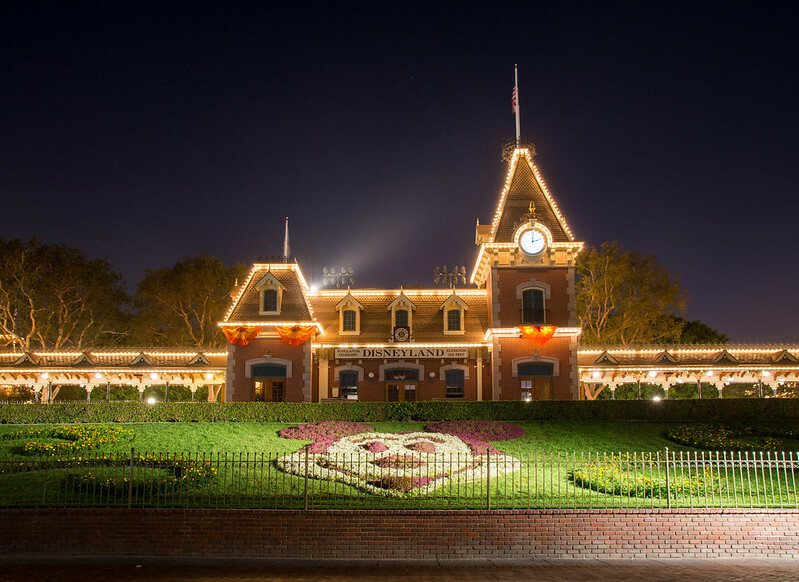 While the Halloween Party, exclusive to guests who purchased the special event ticket, took place from 6 PM to 11 PM, the ticket allowed entry to Disneyland as early as 3:00 PM. 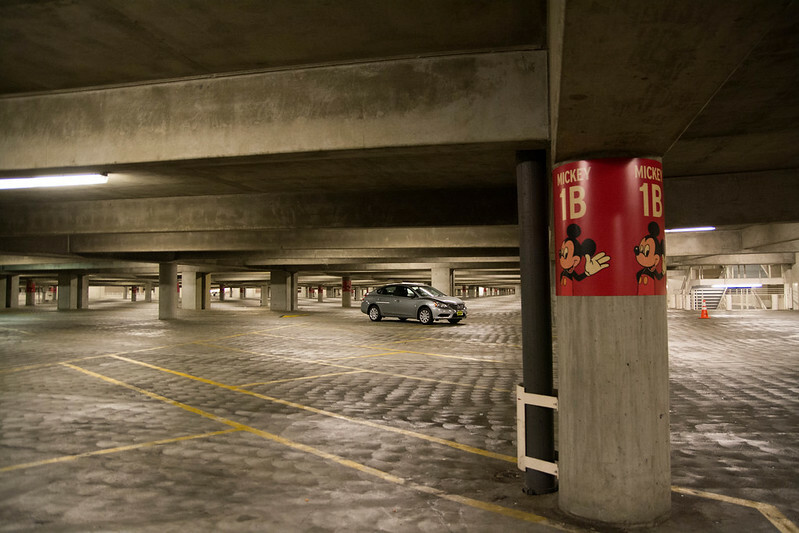 On top of that, parking (typically $17) was complimentary for Halloween Party guests. 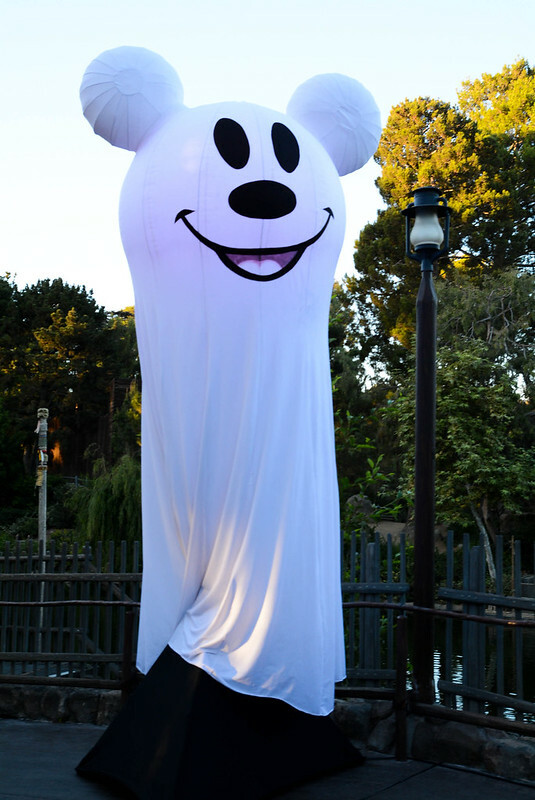 While for guests who have purchased multi-day tickets or are annual or season passholders to Disneyland might question whether or not the Halloween Party is worth the additional $63, for me, a day guest (holding off on purchasing tickets because I can't decide if I want/need an annual pass) it was a no-brainer. Now, I had planned to enter the park exactly at 3:00 so that I could maximize my day... but I left a little behind schedule, and traffic and road construction caused a major delay. 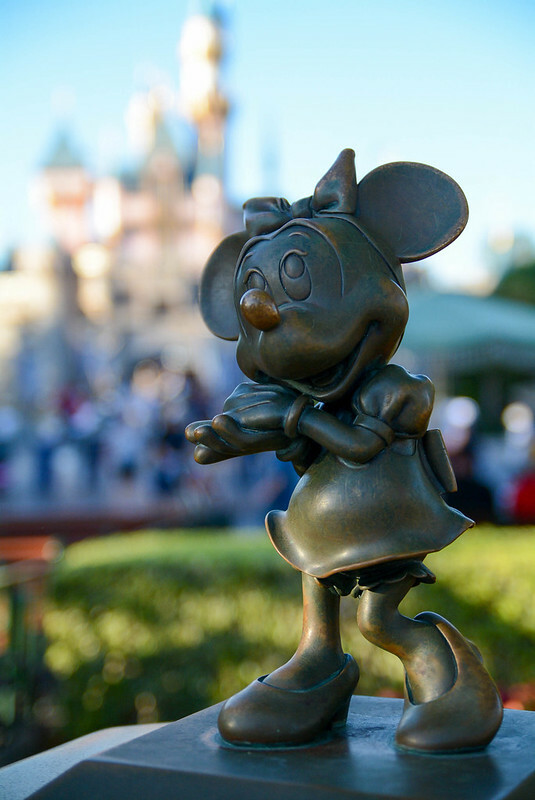 So I arrived at Disneyland at 3:00 (phew, on time!)... and had to wait in a ridiculously long line to enter. I was wondering what the hold-up was. 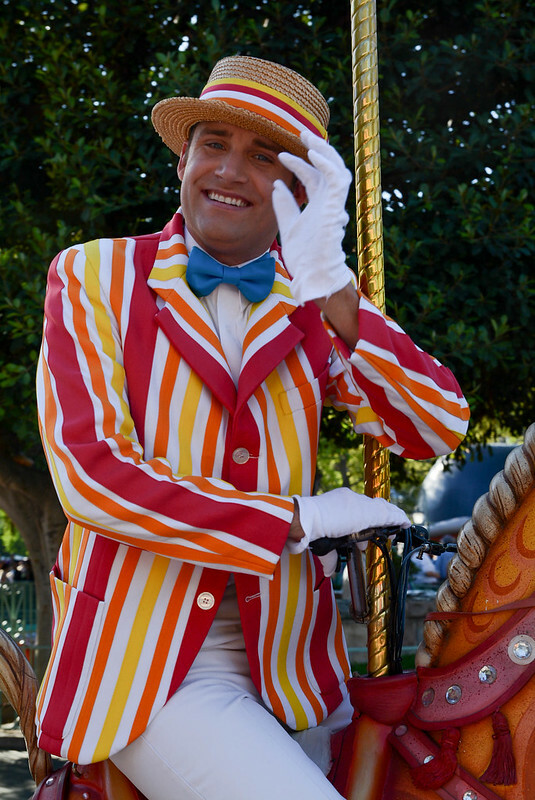 Part of it is that Disneyland is still using turnstiles (let's get some Magic Bands!) and the eTickets were having difficulty scanning, and the other cause for delay is that as soon as we entered, we received a wristband... and the wristbander for my line was a little clumsy with his hands. 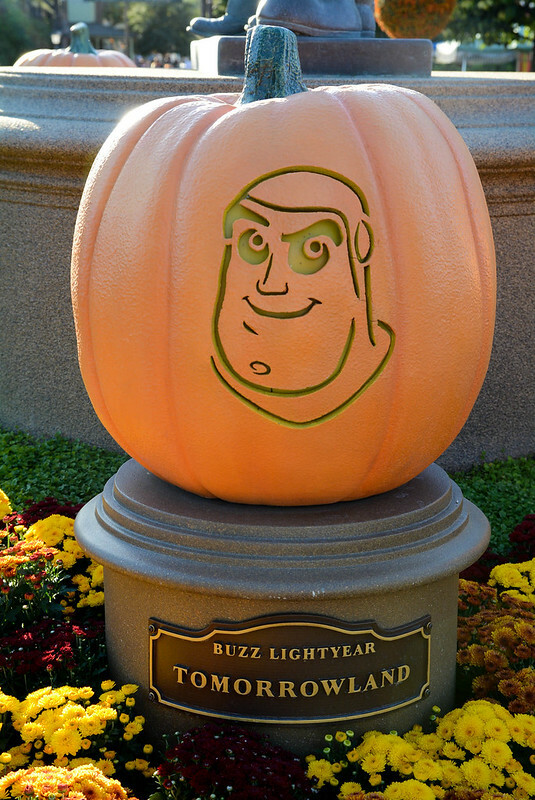 Disneyland has the most wonderful Halloween decorations! 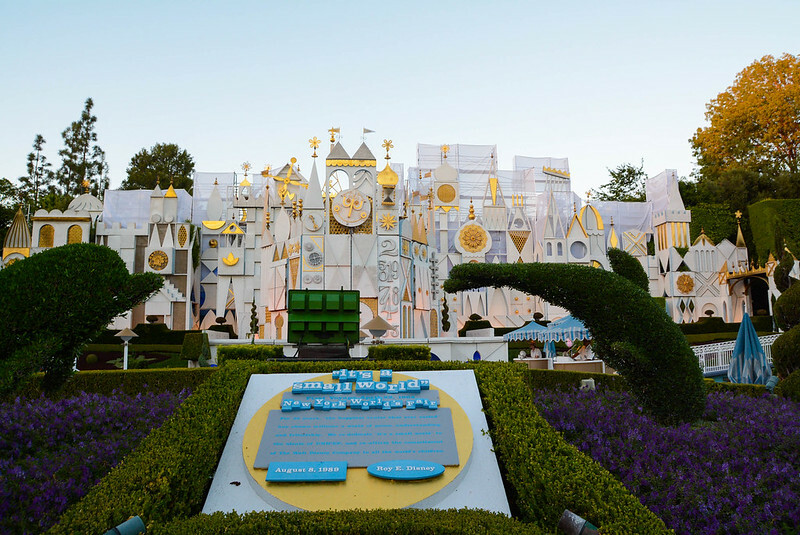 I haven't visited Disneyland since 2005 for the 50th Anniversary... so while I had fond memories of the park, my navigational skills were a little off. Between Magic Kingdom, Disneyland Paris, and Disneyland, I kept getting a little confused and had to refer to my map every so often. Another thing that I almost forgot is that Disneyland still uses paper FastPasses! 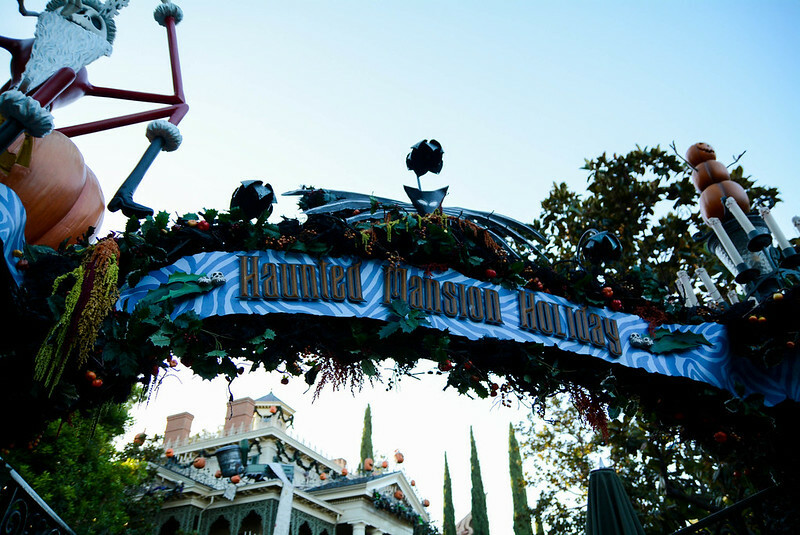 I started towards Haunted Mansion, the first ride I wanted to do, when I remembered that I should grab a FastPass for Space Mountain. 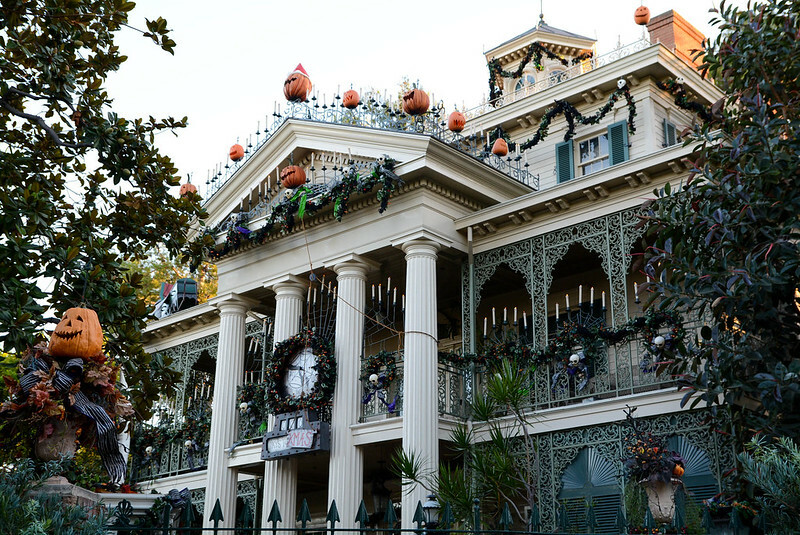 Though I wouldn't have gotten to Haunted Mansion, anyway, because I was headed towards its Magic Kingdom location in Liberty Square (a land which doesn't exist in Disneyland) when it's actually located in New Orleans Square. 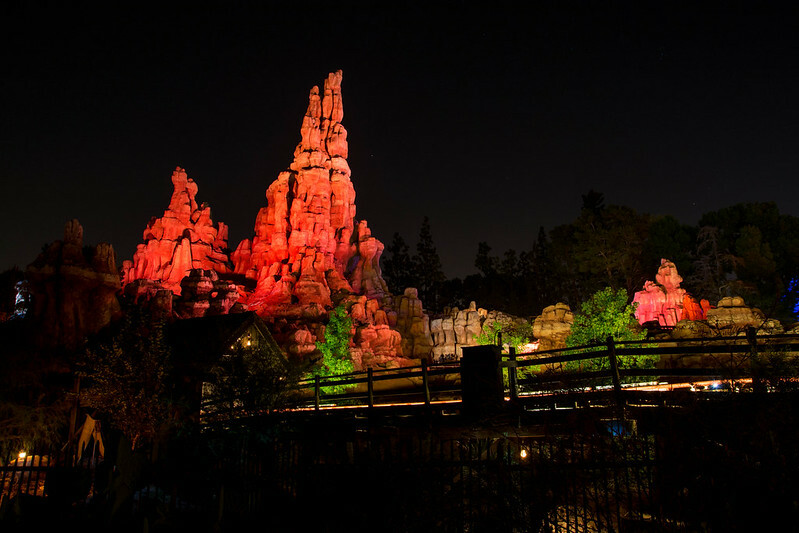 The rides, though some are the same concept or theme, have a different character at Disneyland, whether it's a different scale, color scheme, or architecture. 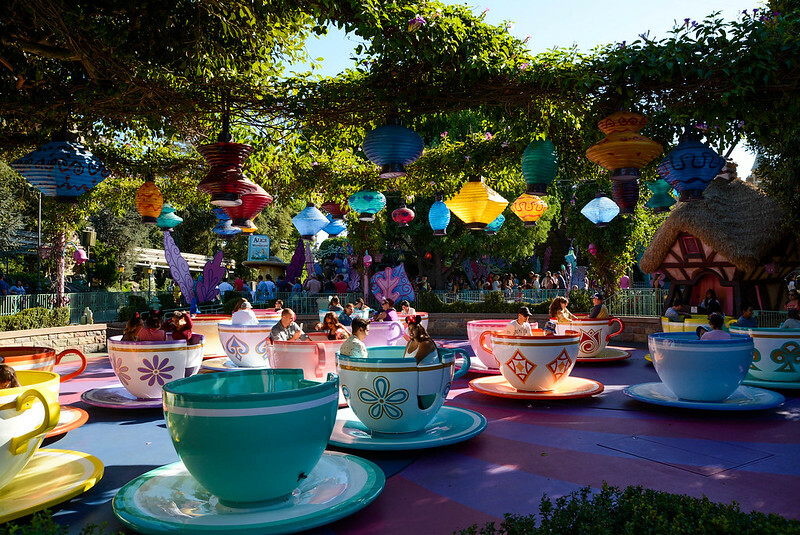 The Mad Tea Party is an attraction that I prefer the Disneyland version of.... look how vibrant and festive! 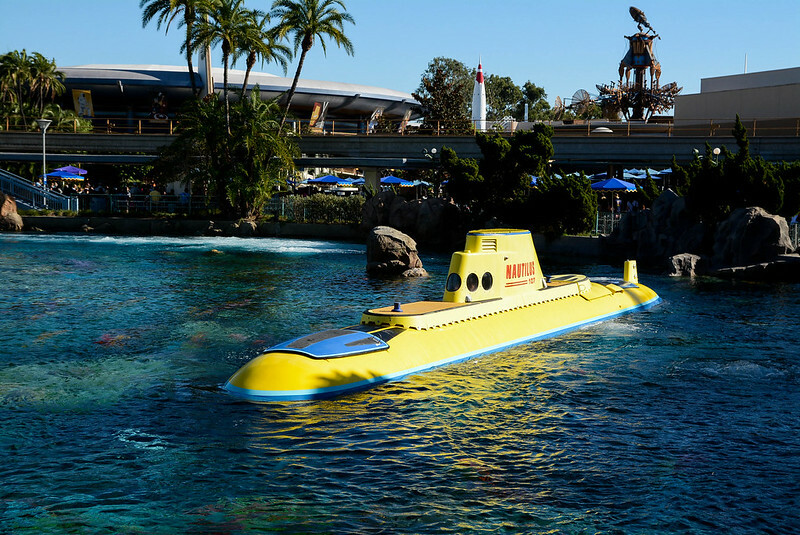 Finding Nemo Submarine Voyage is an attraction that has been added since my last visit. After I obtained my Space Mountain FastPass, I was a little lost. I stopped to look at my map when a cast member came over and asked if he could help me find anything. 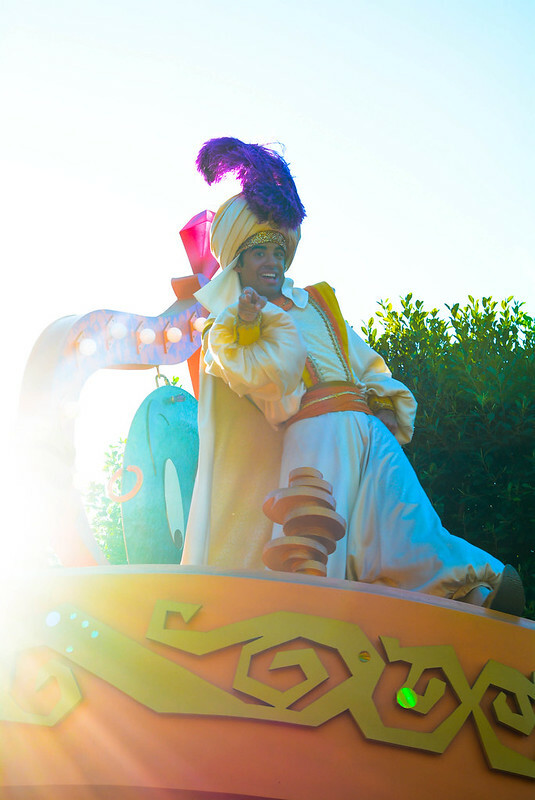 Realizing that people were sitting along a parade route, I asked him what time the parade started, and he told me that it was already headed this way from Main Street. So I decided to stop in the blazing hot sun and watch (and quickly learned why no one was reserving spaces on this side of the street - no shade!). 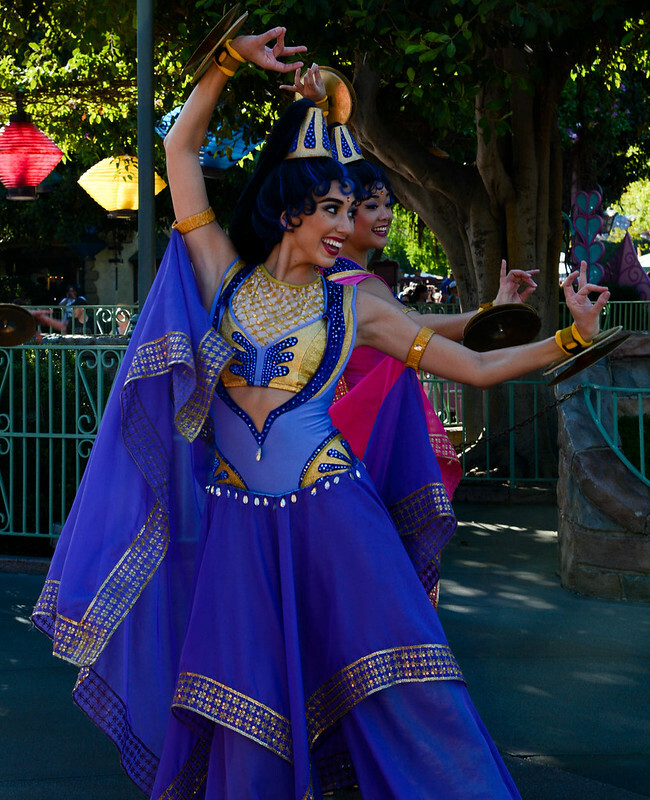 I've said this before, but one of the great things about carrying a big DSLR camera is that the performers will usually pose for you. 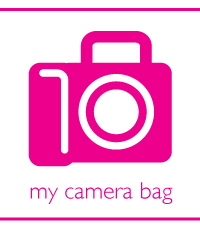 Keep your camera up and capture the moment! The sun was unfortunately at an angle which interfered with my shots, as well as my vision. 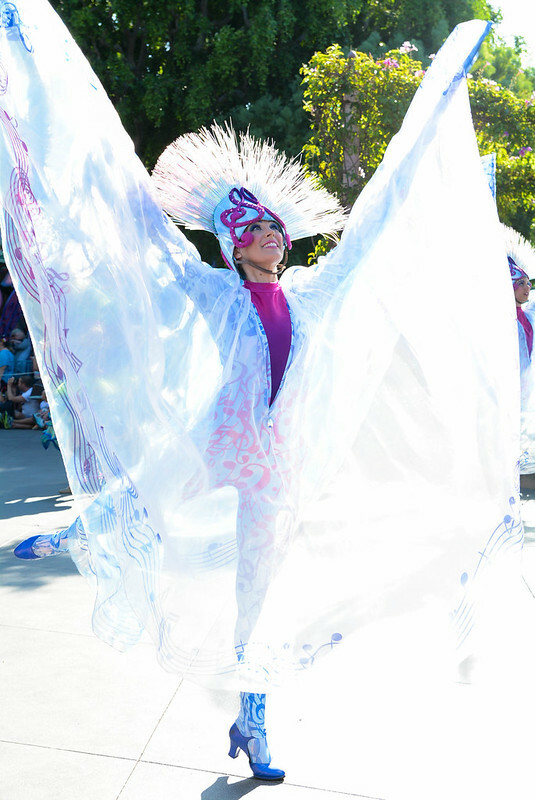 Lately, rather than fighting the sun, I've been playing with lens flares. I hadn't eaten lunch, so I decided to use the time before the party while the day guests were still in the park to eat lunch. 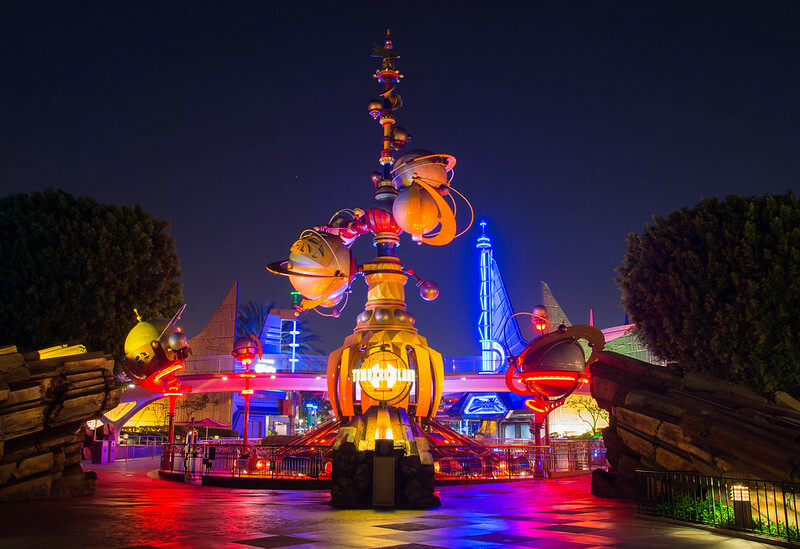 Tomorrowland Terrace was the first dining venue I saw, and I thought it would be a good idea to hang around Space Mountain for my FastPass return time which was soon approaching. Wanting something festive, I ordered the Monster burger. 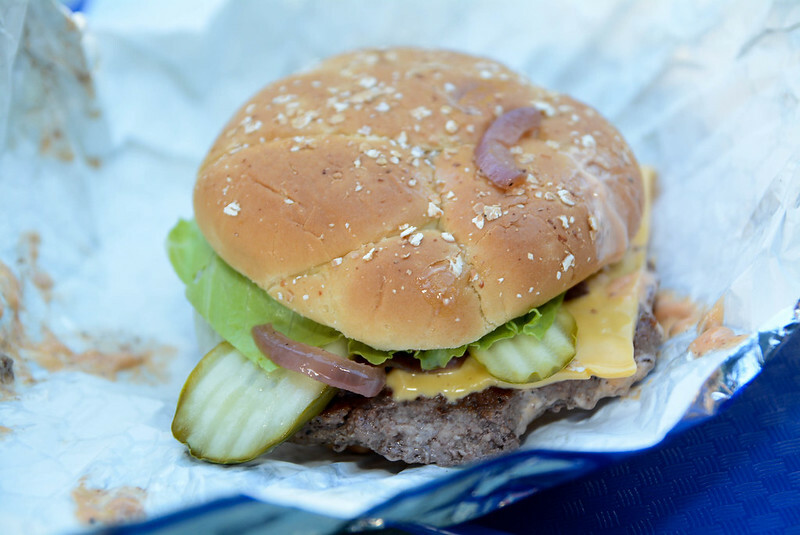 Looks like a regular fast-food burger... and it is. The Monster fries were unique, though! 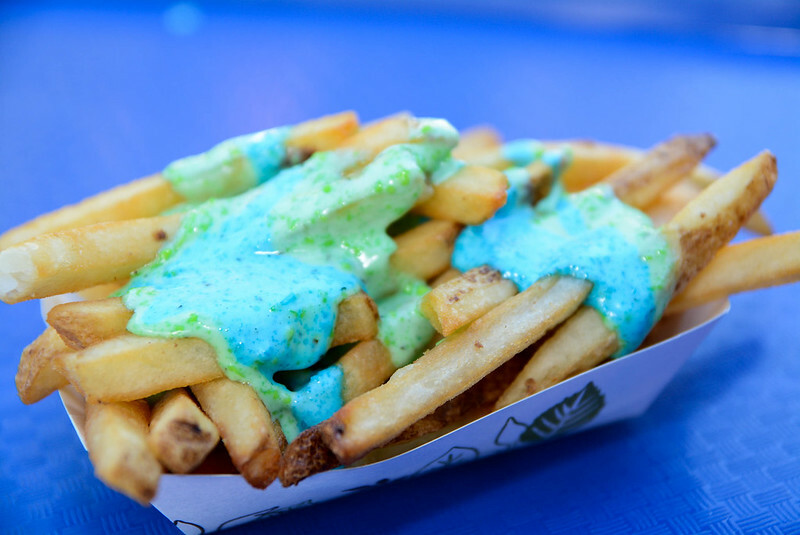 Don't be concerned about the blue... it's bleu cheese (and perhaps the most delicious quick-service fries I've had at a Disney park). 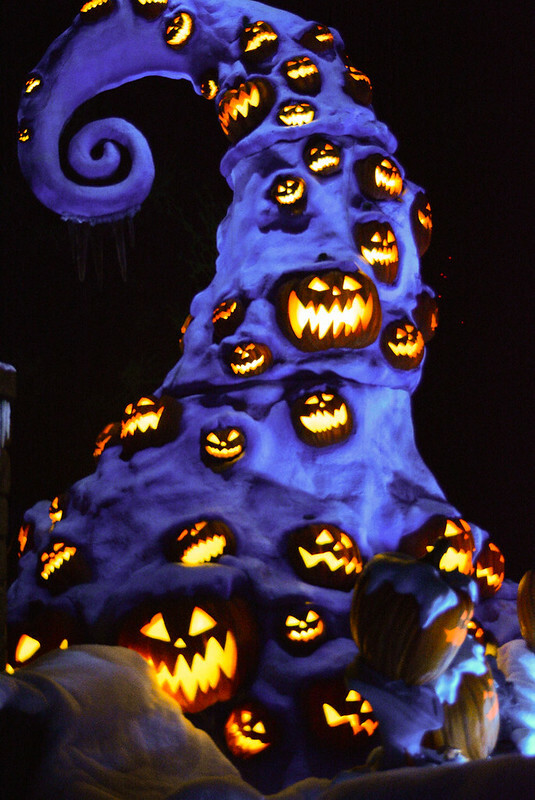 Space Mountain has special Halloween theming... Space Mountain Ghost Galaxy. 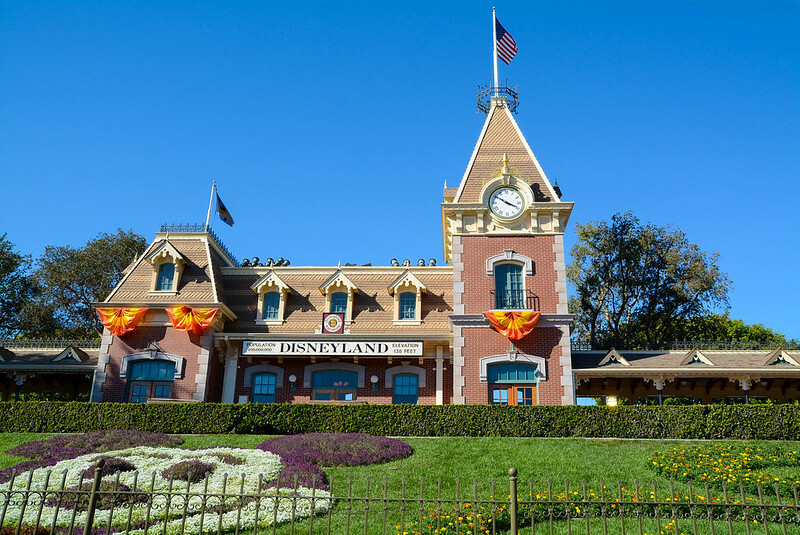 If you're used to the Magic Kingdom coaster, you might not know that Disneyland's is completely different. 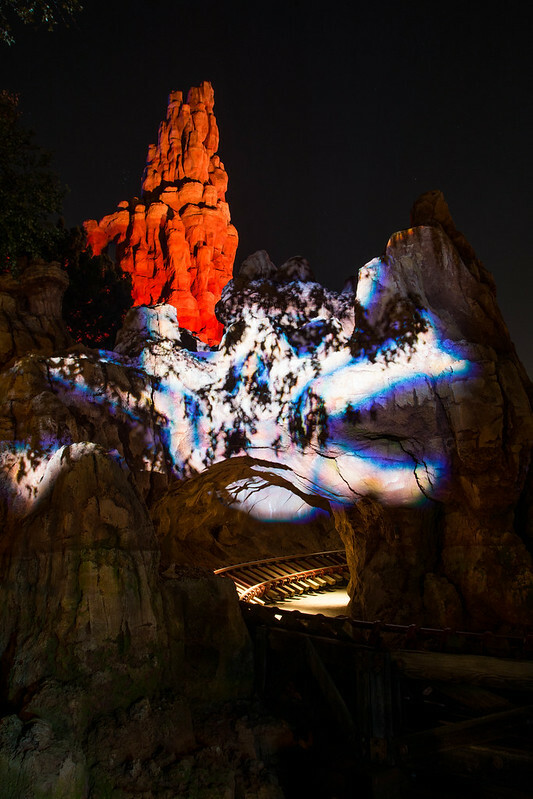 You're seated side-by-side, and the music is synchronized to the coaster. 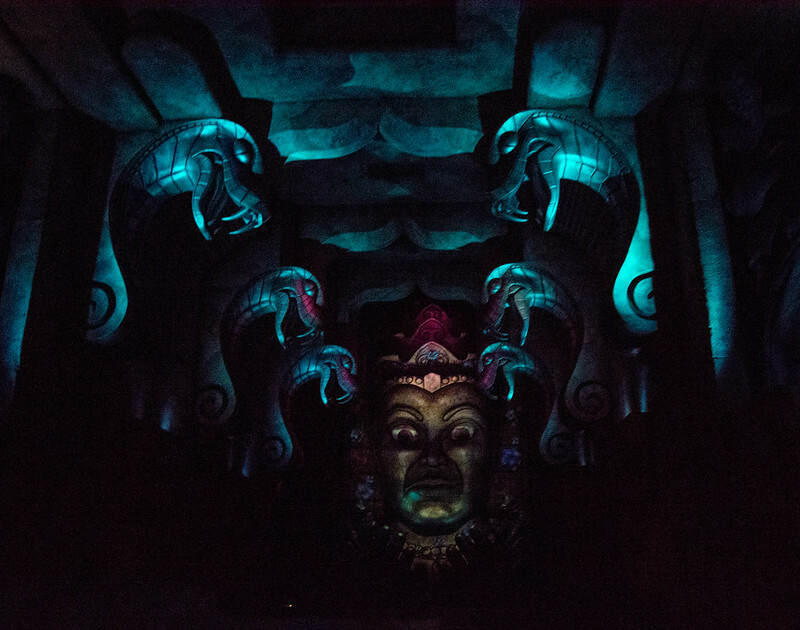 To create Ghost Galaxy, creepy figures are projected throughout the ride, and there are special noise effects. It's actually a little frightening. 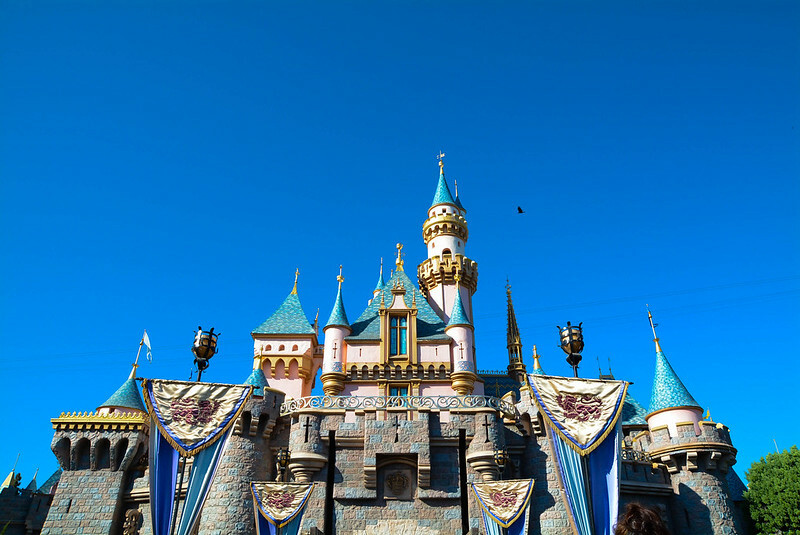 I ventured across the park, stopping in the castle hub. 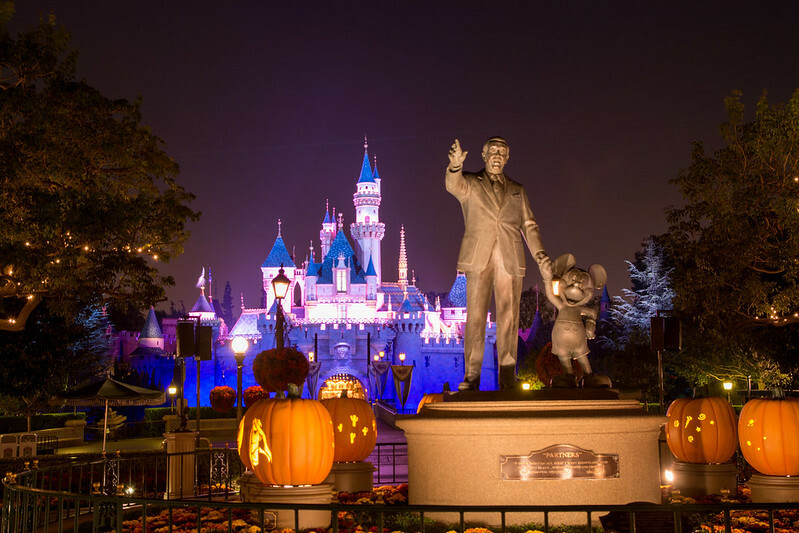 Character pumpkin carvings surrounded the Partners statue of Mickey and Walt Disney, representing all of the 'lands' in the park. 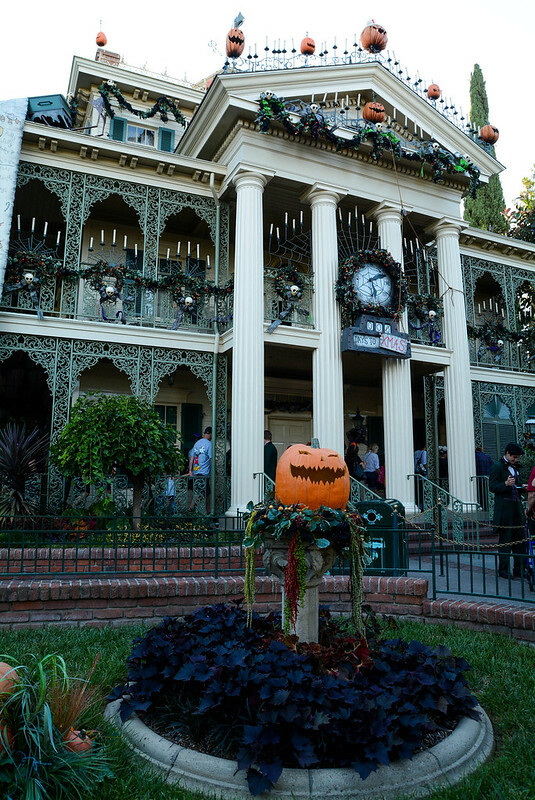 The Haunted Mansion is the other Disneyland attraction re-themed for Halloween. 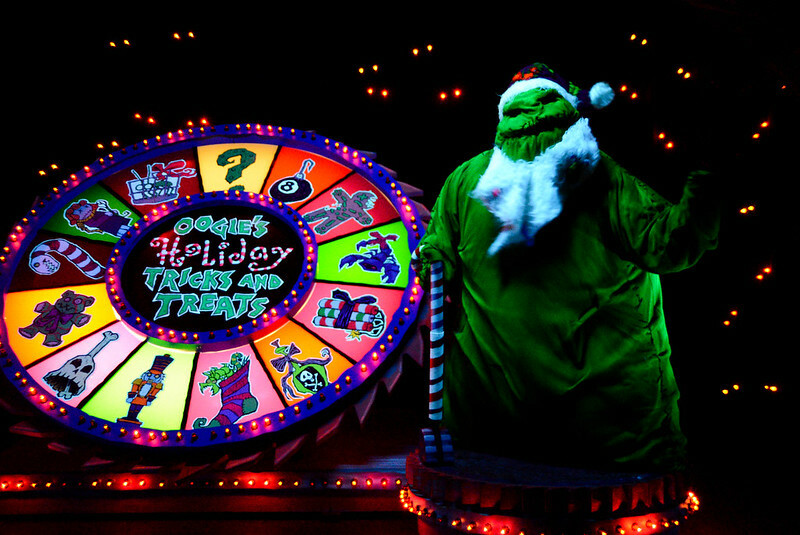 The Halloween theme of "Nightmare Before Christmas" carries over throughout December and the holiday season (for Christmas, it's a small world receives a holiday makeover). 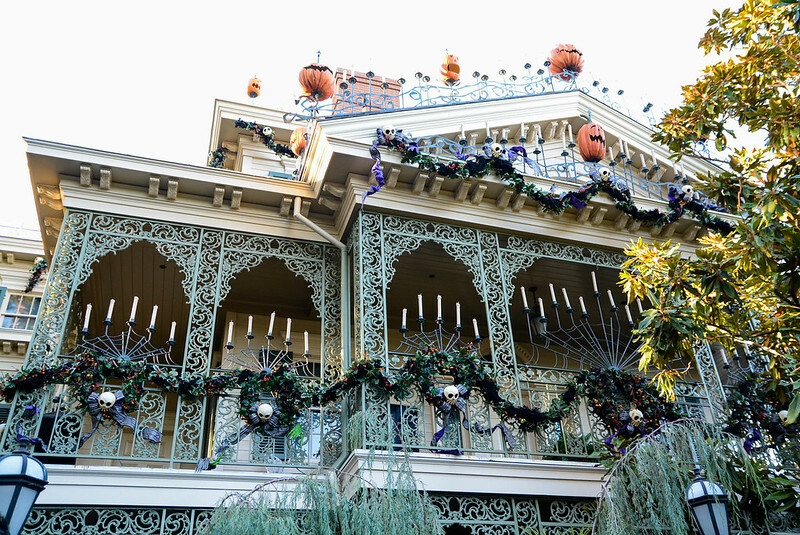 The holiday decorations, both on the exterior and interior of the Haunted Mansion, are extensive. 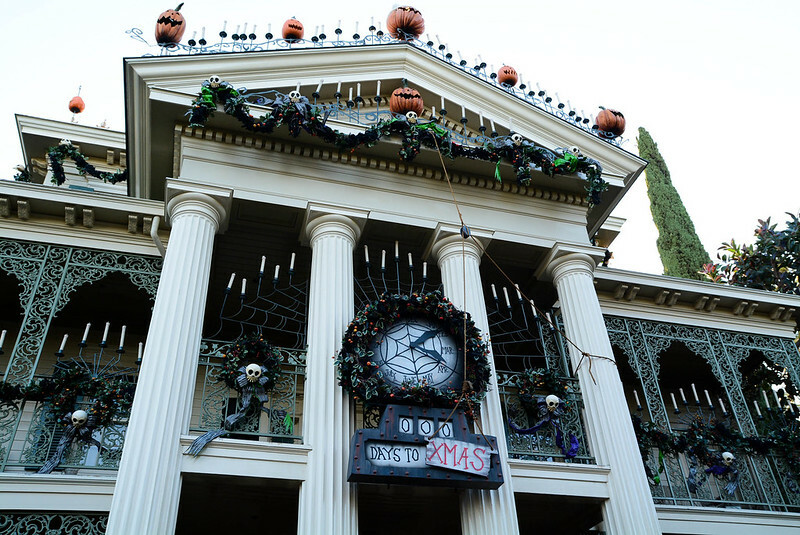 When I emerged from the Haunted Mansion, Mickey's Halloween Party had begun and wristband checks were occurring. 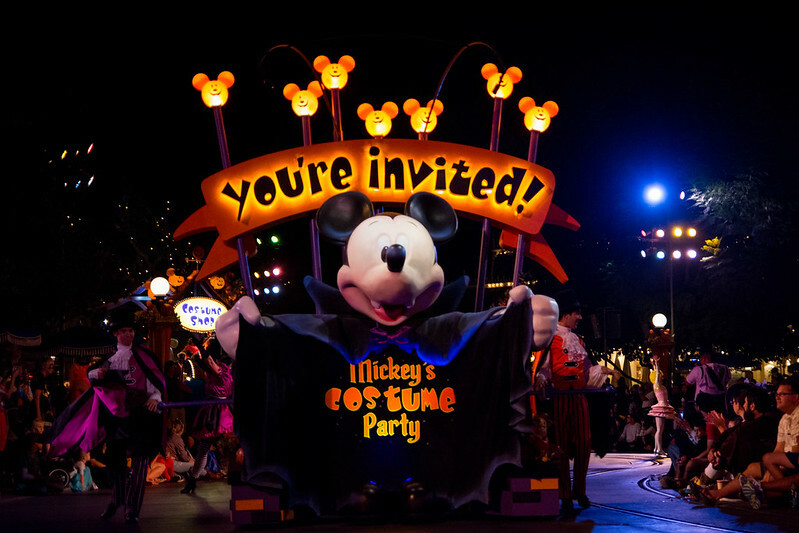 It had been suggested on message boards and social media in the past (for Mickey's Not-So-Scary Halloween Party at Magic Kingdom) that one without the special event admission could potentially remain in the park throughout the party if he had entered the park with a regular admission ticket before the party began. 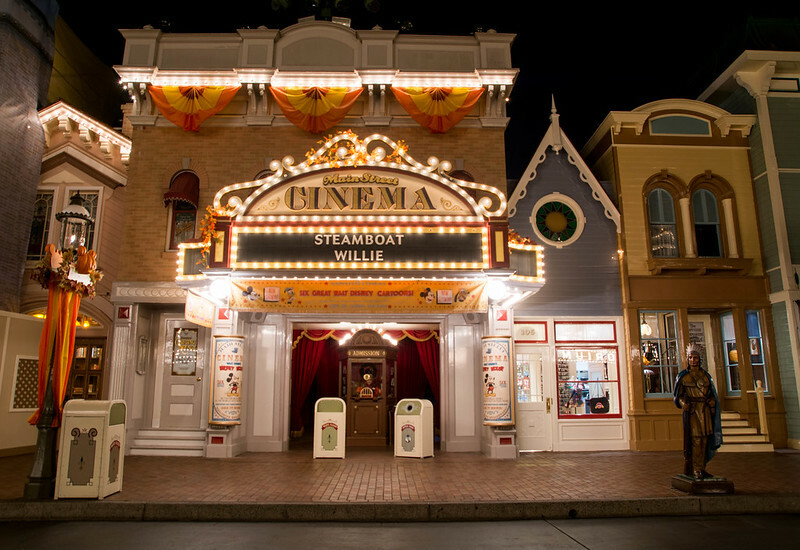 At Disneyland (and perhaps Magic Kingdom, now, as well), this is not the case. 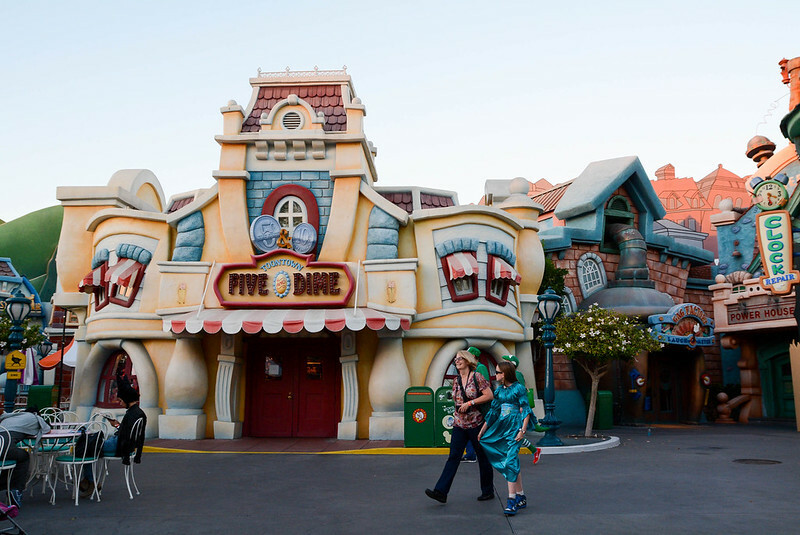 Cast members blocked off each land of the park and checked for wristbands upon entry. 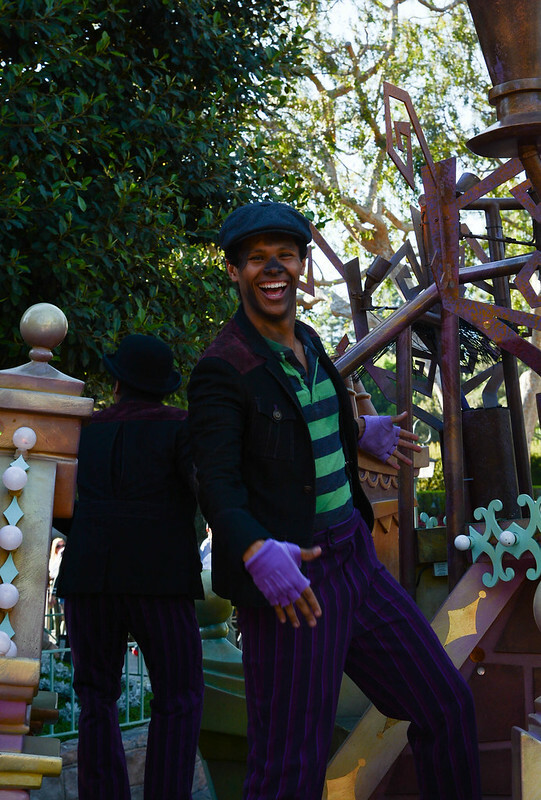 I saw one man without a wristband attempt to get through, and the cast member explained that this party was a special event and that he would need to leave the park. 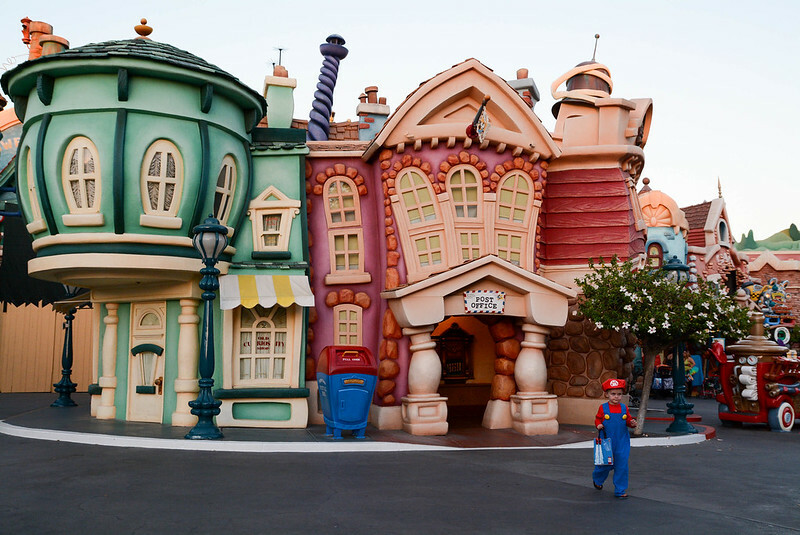 Security guards were also present throughout the park, ushering regular day guests towards the exit. 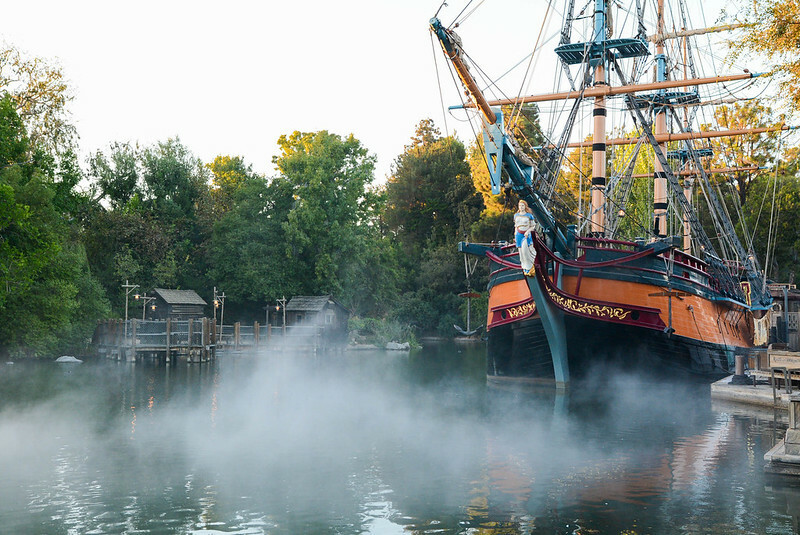 Fog over Rivers of America was one of the special effects for the party. 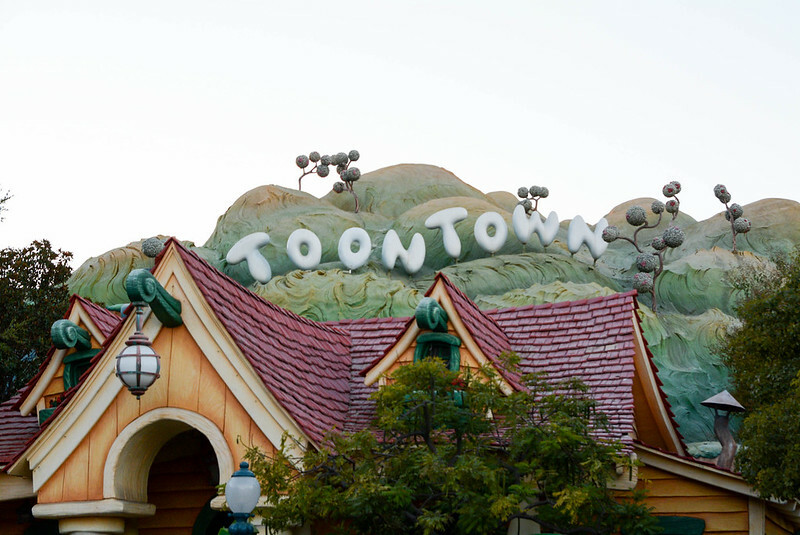 Personally, I think that Toontown is much better executed in Disneyland than it was in Magic Kingdom. The scale here is so much better. 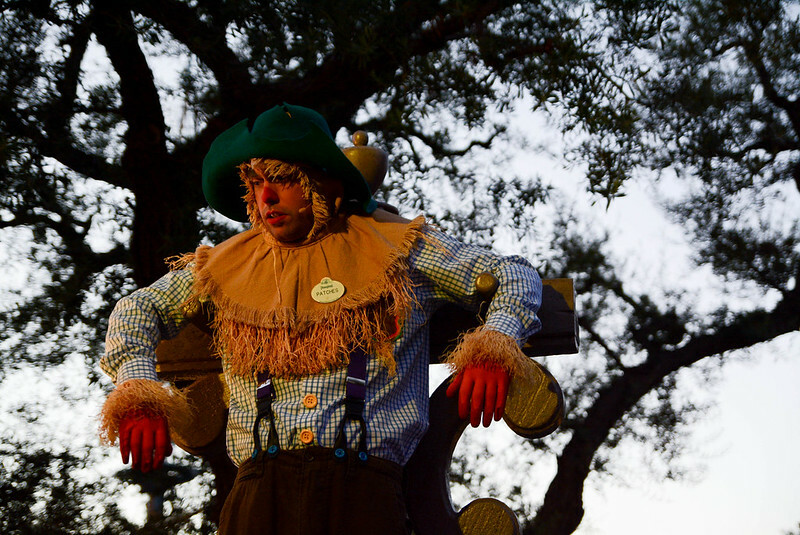 There was a live scarecrow interacting with guests in Frontierland. 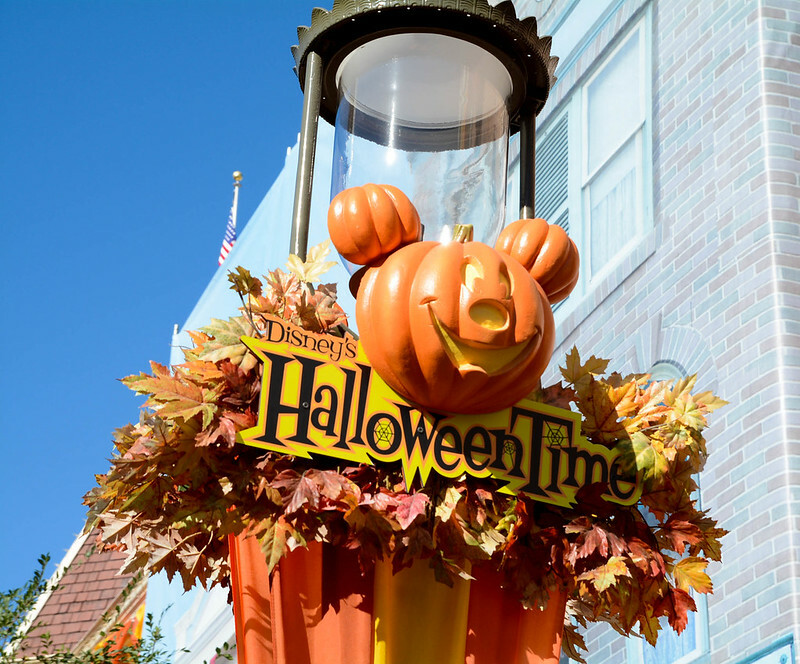 One of the advantages to the Halloween party that makes it so appealing to day guests like myself is that because everyone is collecting candy and taking photographs with characters, wait times for rides are minimal. 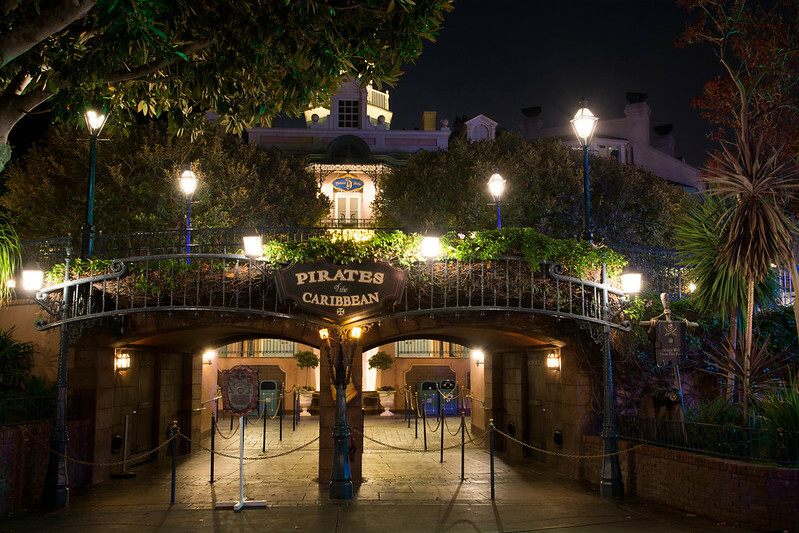 I walked right on Pirates of the Caribbean! 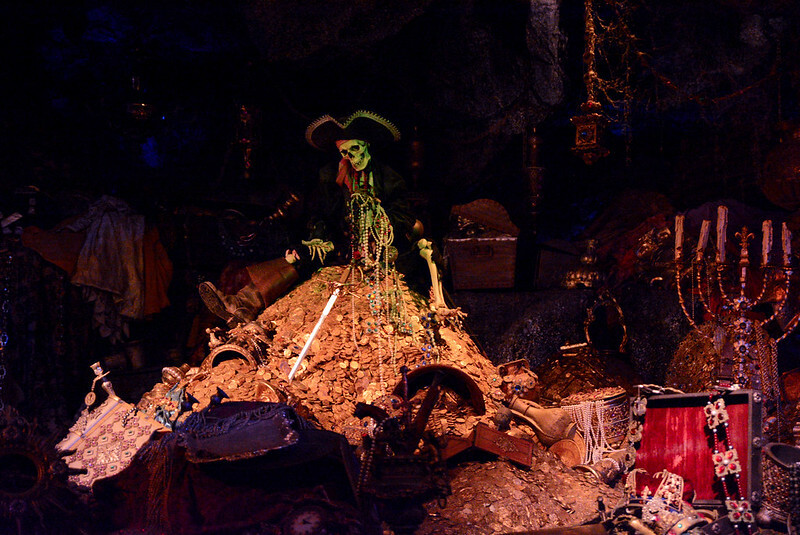 Photography on Pirates of the Caribbean is tricky due to the red lighting cast throughout the attraction. Normally I don't even bother, but I had an entire row to myself, so I figured I might as well give it a try. I had to do a good bit of desaturating, and it's grainy due to high ISO. We wants the redhead! 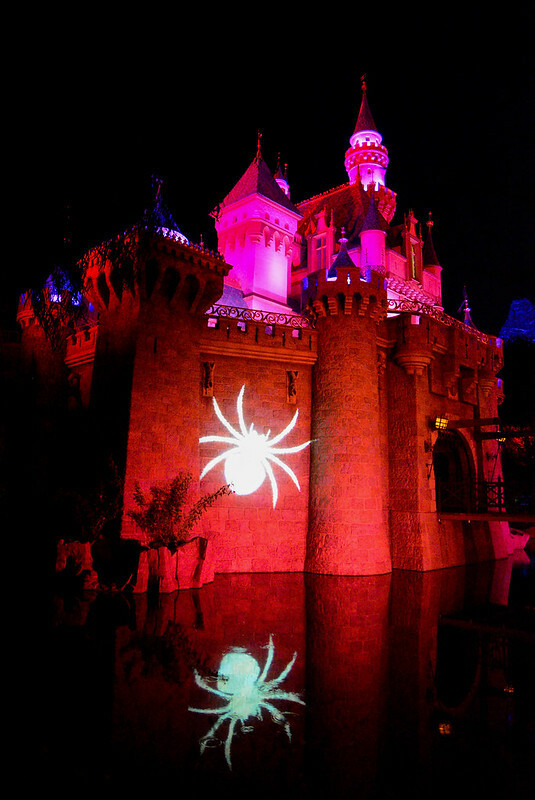 Spiders invaded Sleeping Beauty's Castle throughout the night. 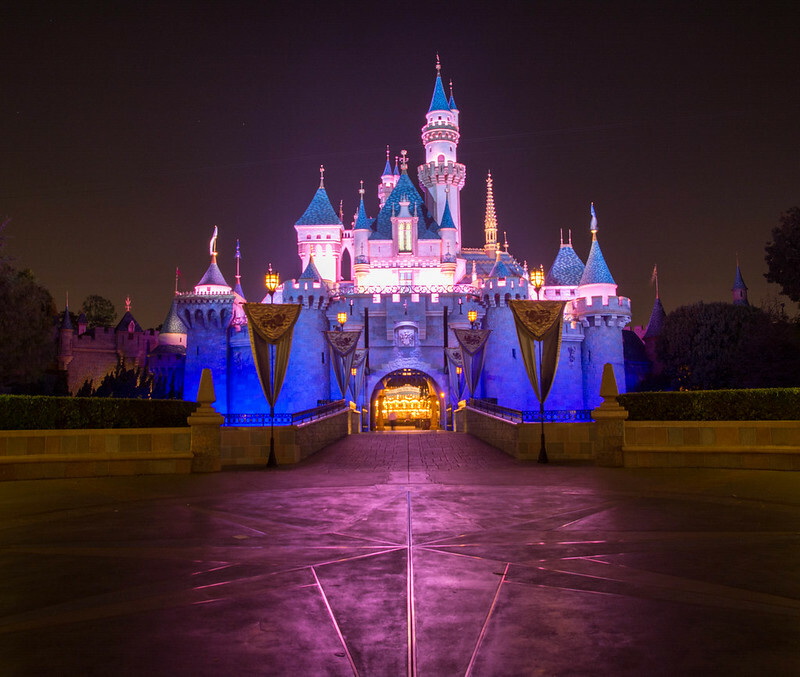 I was checking on the castle hub because I wanted a prime spot for fireworks, but no one was lined up, yet. I don't know what I was thinking. I should have claimed my spot and waited. 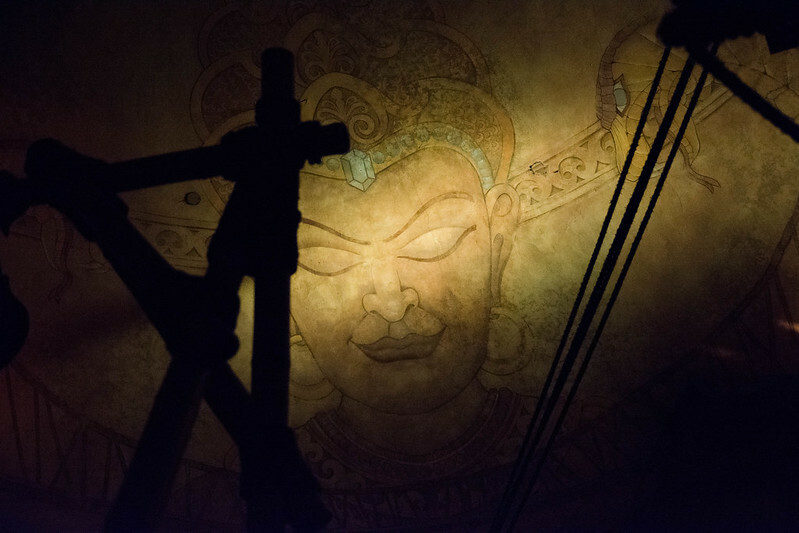 But I decided to push it for a posted 10 minute wait for Indiana Jones Adventure. Note I said posted. 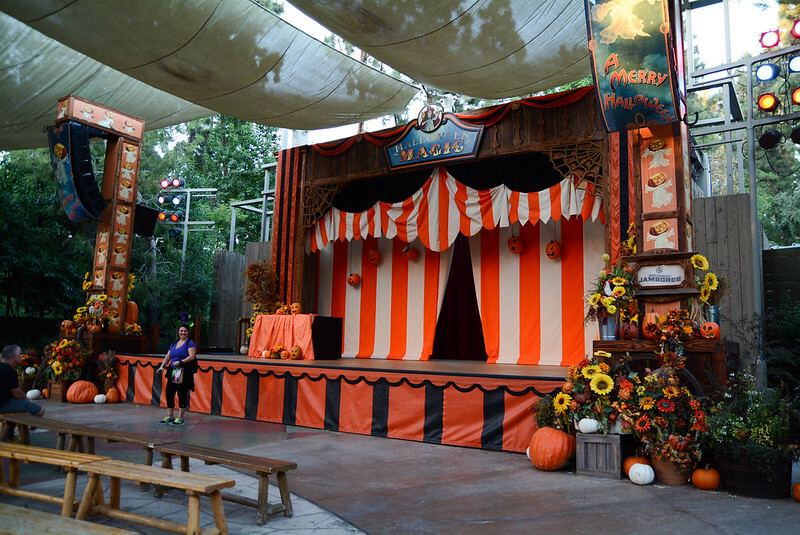 It was actually more like a 20 minute wait... then I finally get to the boarding area, and the attraction breaks down! I was furious, and wanted to get out of line.... but I had already invested so much time! At least it was a fun attraction. The ride cars are the same as those for DINOSAUR at Animal Kingdom, but the ride is less dark and choppy (but I've never minded Dinosaur's darkness). 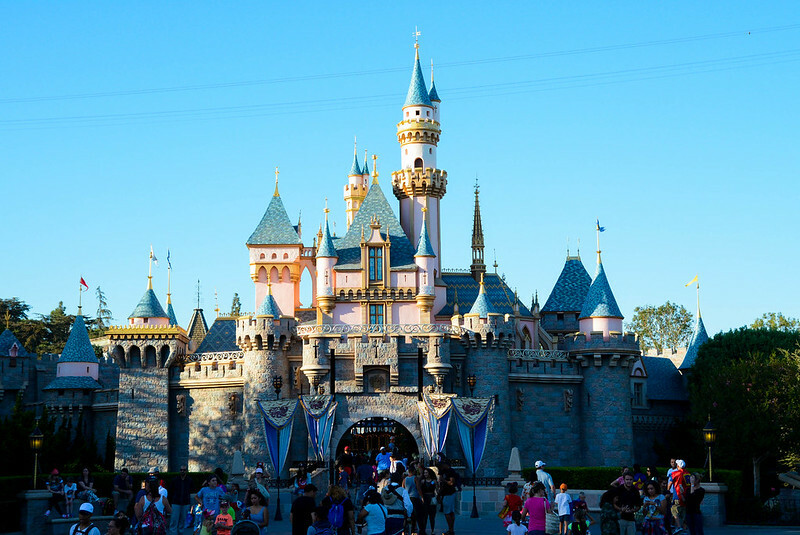 The castle hub in Disneyland is lovely - much more green than Magic Kingdom's. This is a problem with fireworks views. 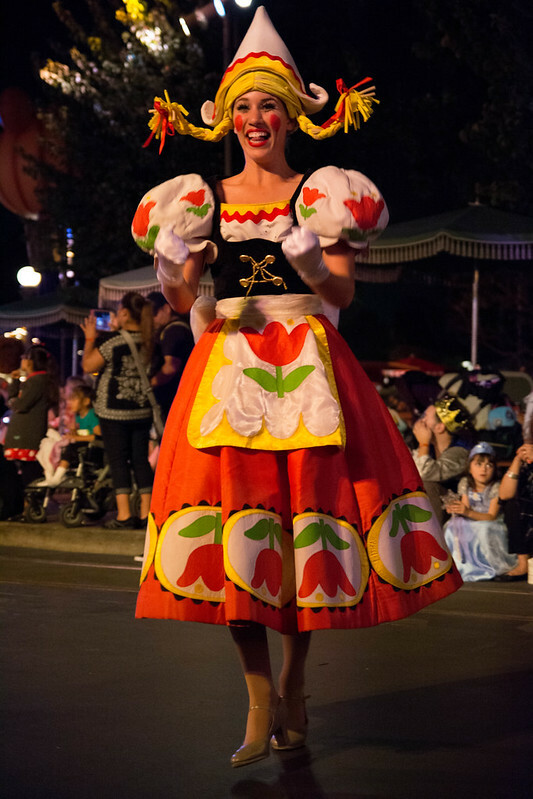 By the time I arrived in the castle hub, the first Halloween parade was just beginning, and I couldn't get anywhere near the center of the castle. 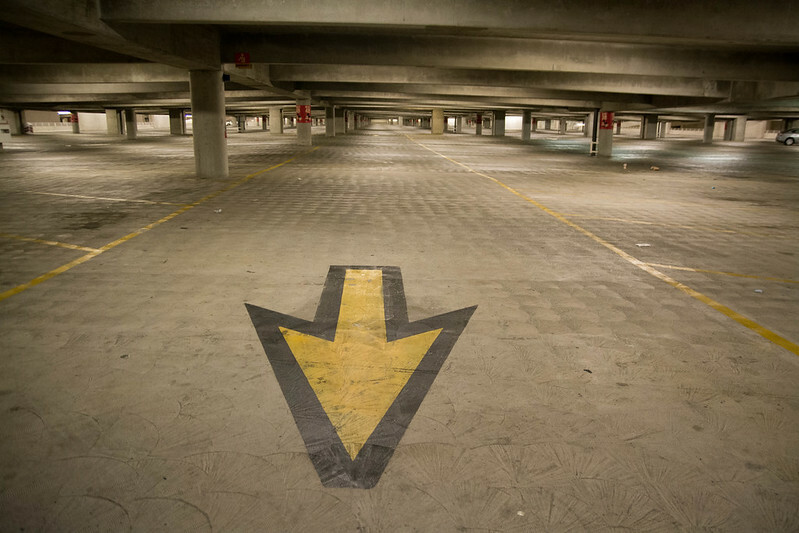 I really wished that I had a buddy there to hold my spot while I went searching to see if I could find a better one. But I didn't. So I got as close as I could and parked it behind a tree. Really, I should be glad that I got a spot this good... but I was really upset at myself for thinking that I had enough time for another attraction before fireworks. 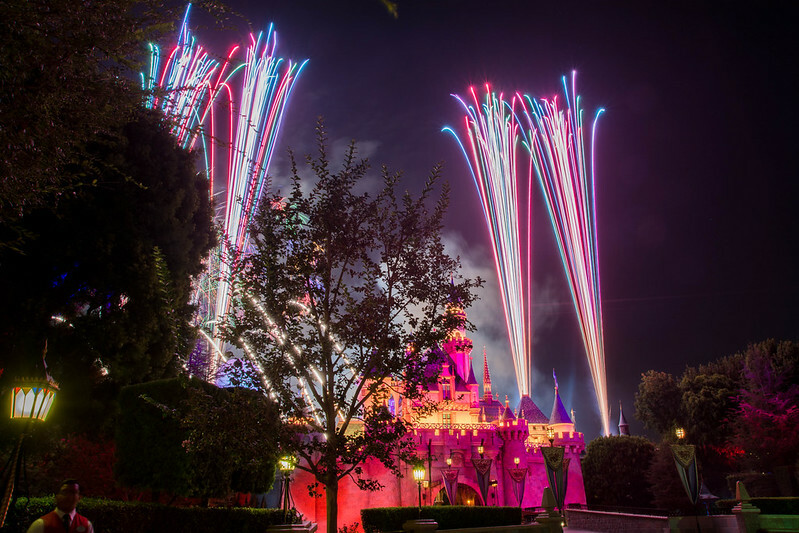 The issue with the left side of the castle is that a good portion of the fireworks are shot on the left side... and the trees block the view. Stupid trees. Not wanting to mess up, again, I decided to go ahead and claim a spot for the parade. It turned out that I would have been fine just walking up five minutes before start time, but I wasn't about to risk it. 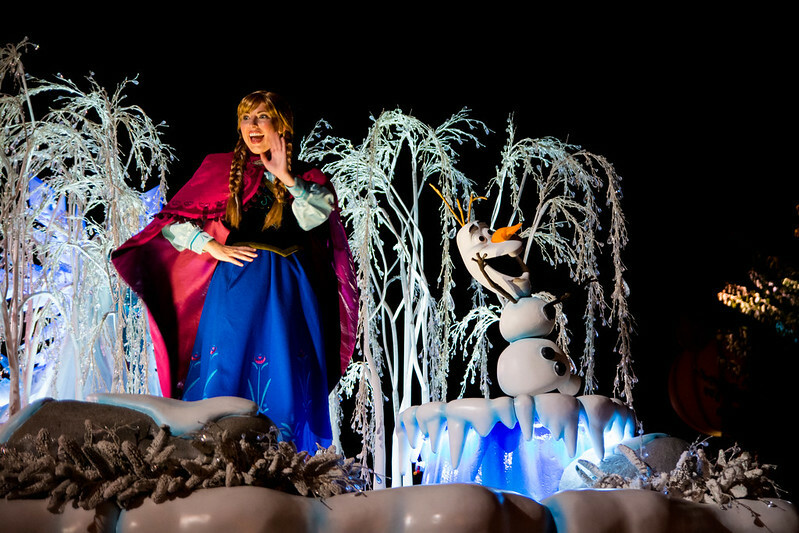 Before the Halloween parade, Anna, Elsa, and Olaf came through the Magic Kingdom to say hello. 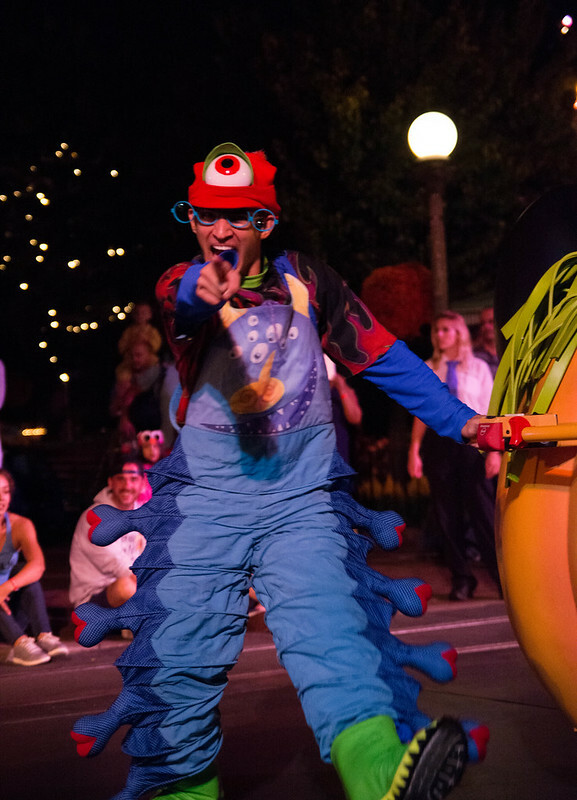 Mickey's Costume Party Cavalcade isn't a bad parade... but it just isn't unique and spectacular as Magic Kingdom's Boo to You Parade. 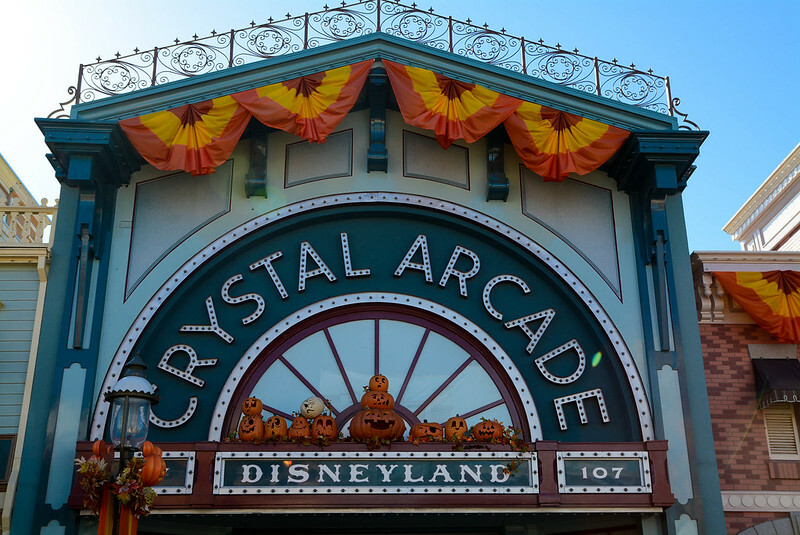 I'm going to be critical - Disneyland's version just felt a little childish. Let's start with the music - it's kids singing about what they could be for Halloween. "I could be a pirate!" "I could be a princess!" It just felt a little dumbed down. Also, it's not the least bit spooky. 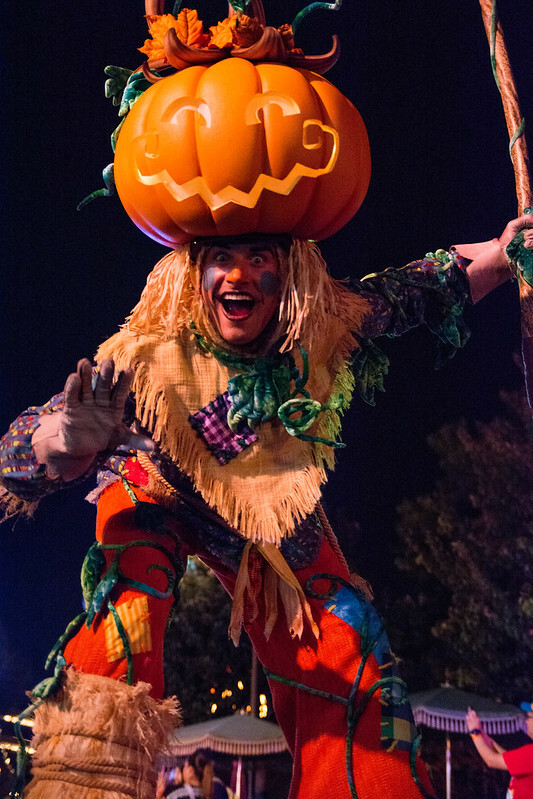 I know at Magic Kingdom they call it Mickey's Not-So Scary Halloween Party, and at Disneyland they don't even bother to mention that in the name, but the Boo to You Parade has low lighting, fog, pirates, and the headless horseman! It feels very Halloween. 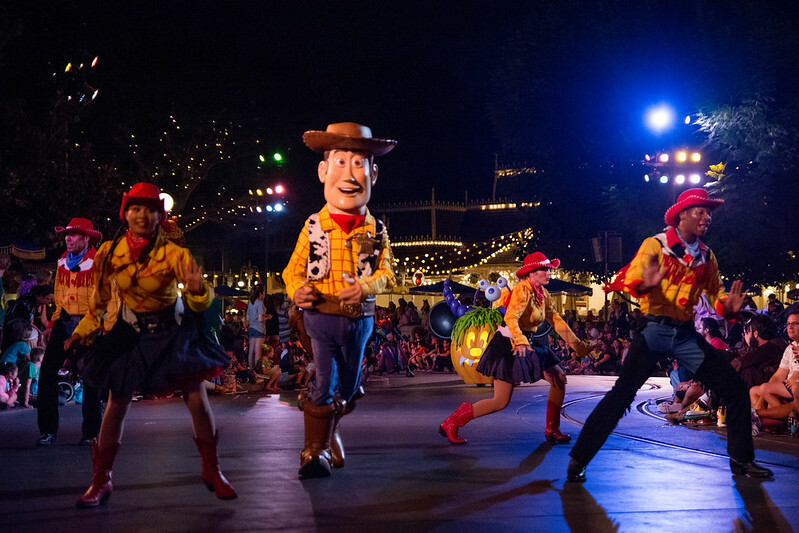 Mickey's Costume Party was essentially just a parade of Disney characters, adding in a few pumpkins here and there, as well as classic Mickey & Friends dressed in their Halloween costumes. 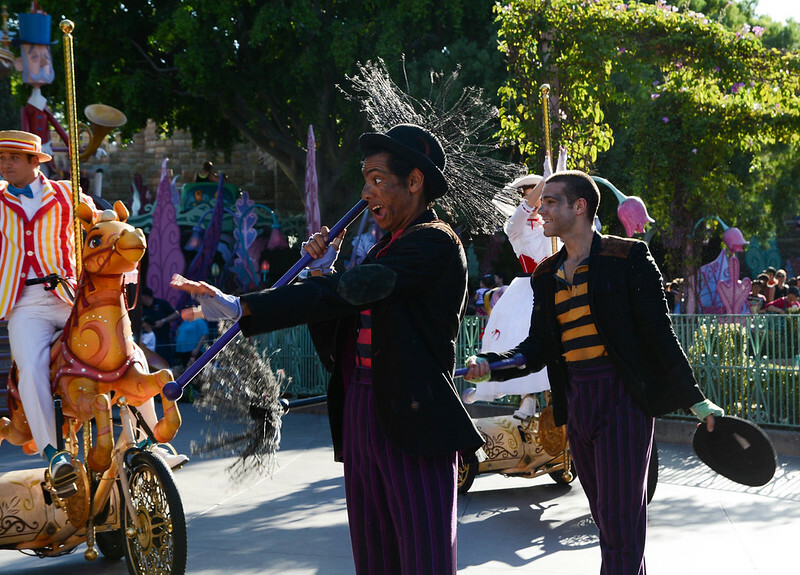 Take away the slight seasonal theming, and this parade could occur at any time of the year. 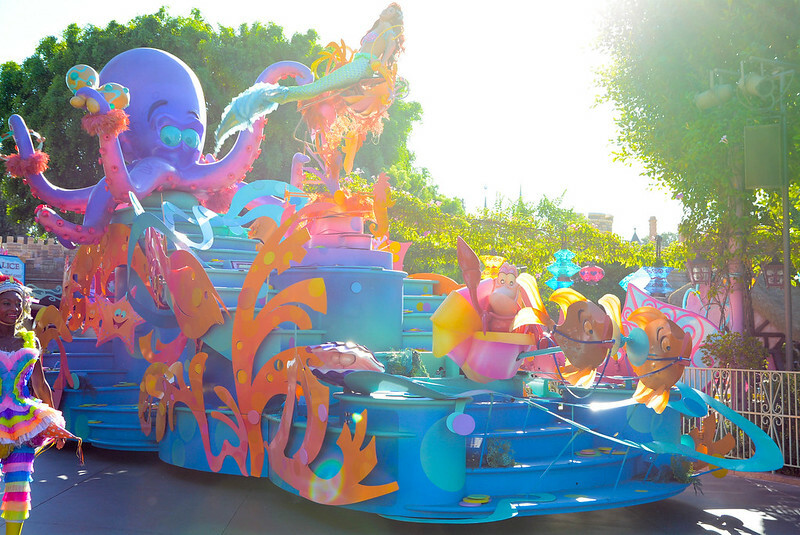 There also aren't many floats. 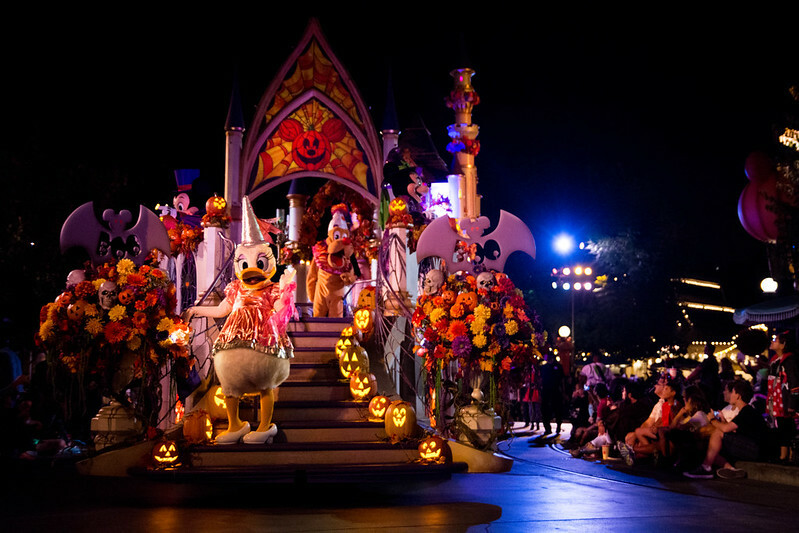 There is the initial push float with the big vampire Mickey, the Costume Shop float, the themed Mickey-shaped jack-o-lanterns, and then the final castle float with Mickey & Friends. Other than that, it's just characters.... most of which aren't particularly related to Halloween or dressed for the occasion. 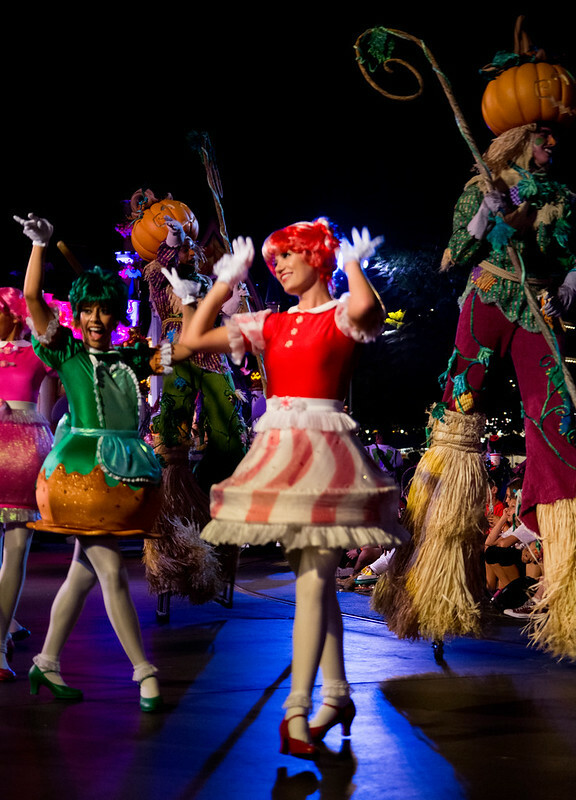 Like what the heck does a peppermint have to do with Halloween? At least throw in a Candy Corn! 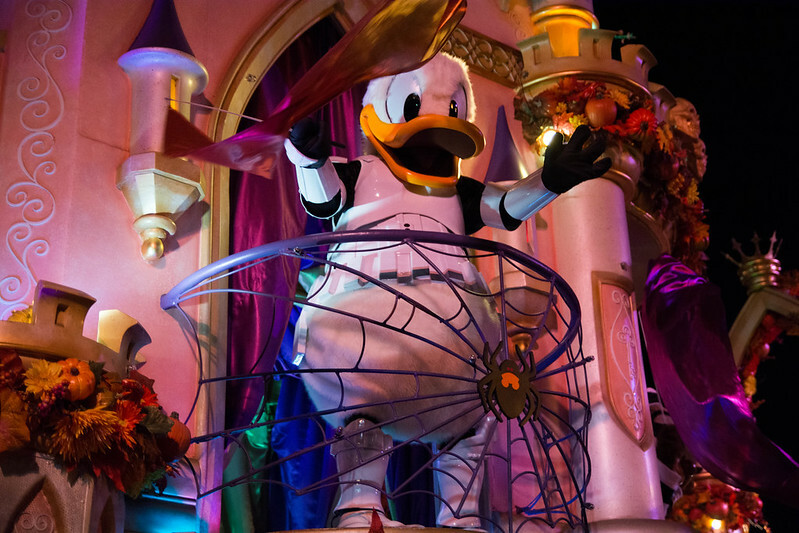 The best part of this parade for me was Stormtrooper Donald (nevermind that he wears that exact costume for Star Wars Weekends). After the parade, I decided to spend the last half hour left of the Halloween party seeking out the character greetings that I had ignored earlier due to the long lines. 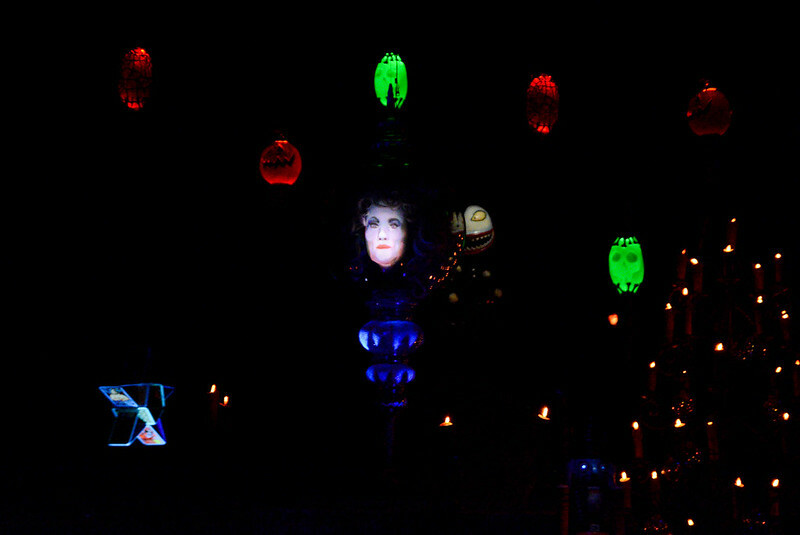 Waiting was a good move - the lines for characters had seriously diminished since earlier that evening. 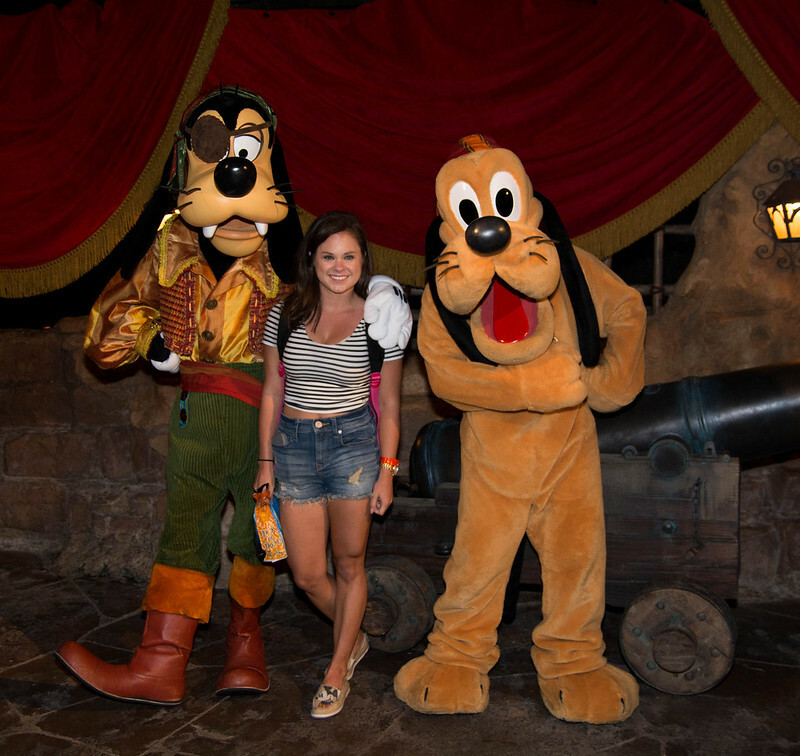 First, I stopped by Big Thunder Ranch and met Pluto and Goofy. Then met Wendy & Peter at Pirate Wharf. 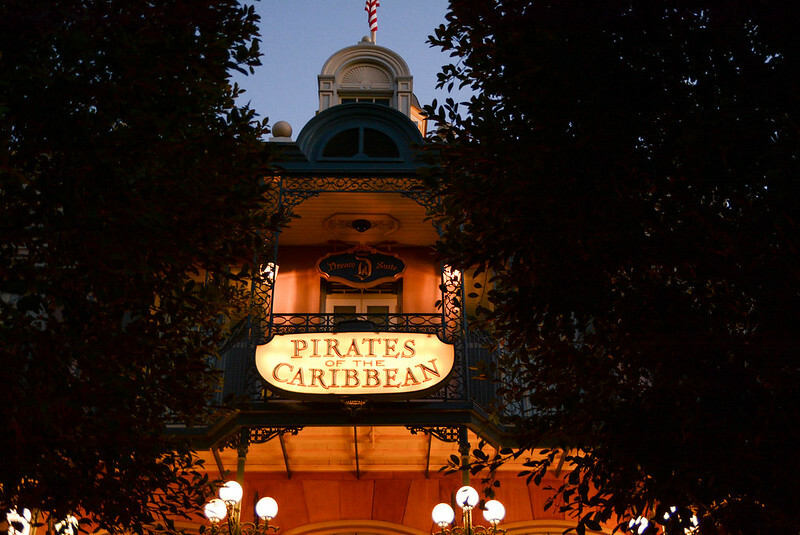 The people in front of me were waiting for Captain Jack Sparrow, but I wanted Peter, so they were very excited to see me. I was excited to finally get a photo of Peter... 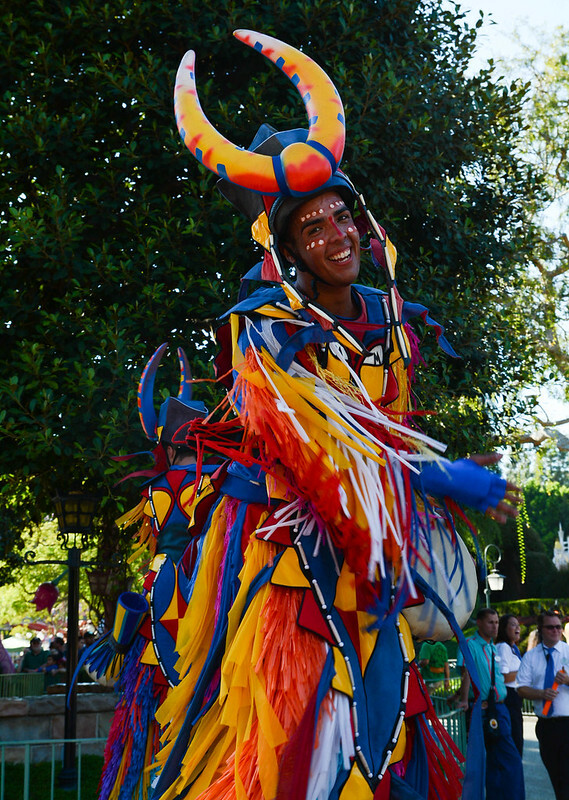 I had tried to photograph him in both parades, but he runs around maniacally and is difficult to capture. 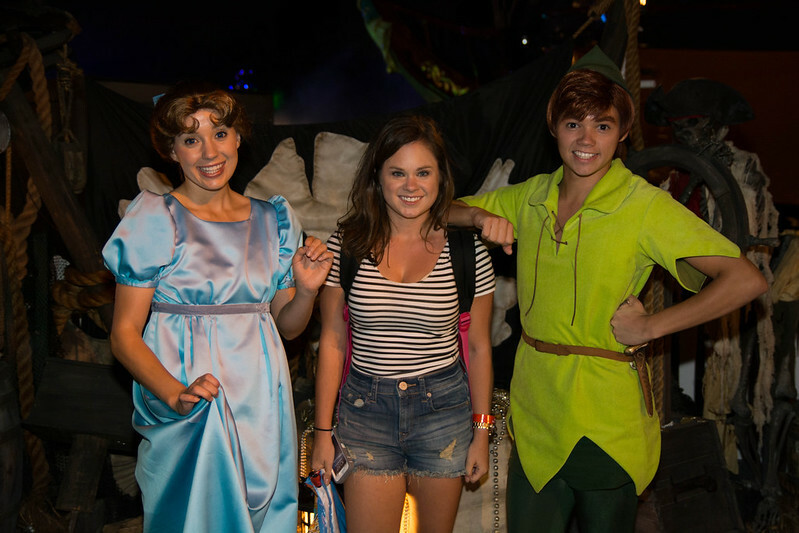 Finally, I was really hoping for Mickey & Minnie, but it was almost 11 PM, and they weren't at their Meet & Greet. I walked by, then circled back around and saw people in line and decided that they must be waiting for something. The people in front of me told me that Mickey & Minnie would be returning, and that they were closing the line soon, so I stayed put! 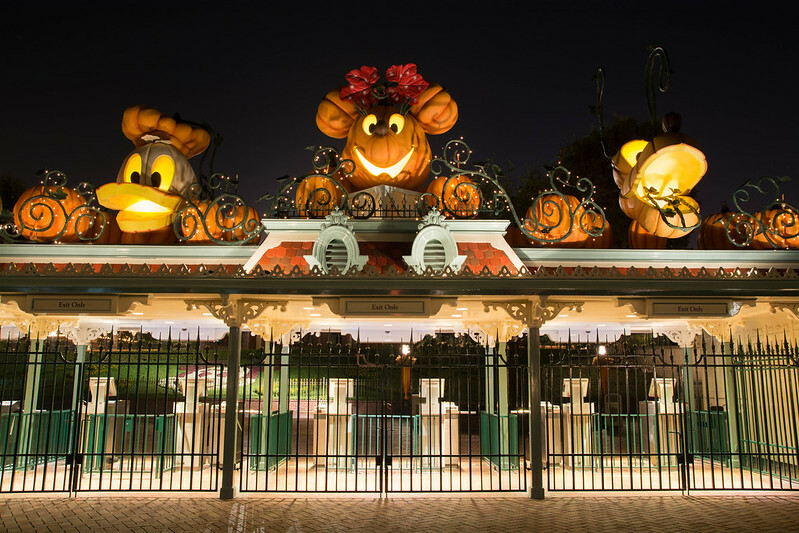 Sure enough, Mickey & Minnie came back right at 11 PM to continue greeting guests. 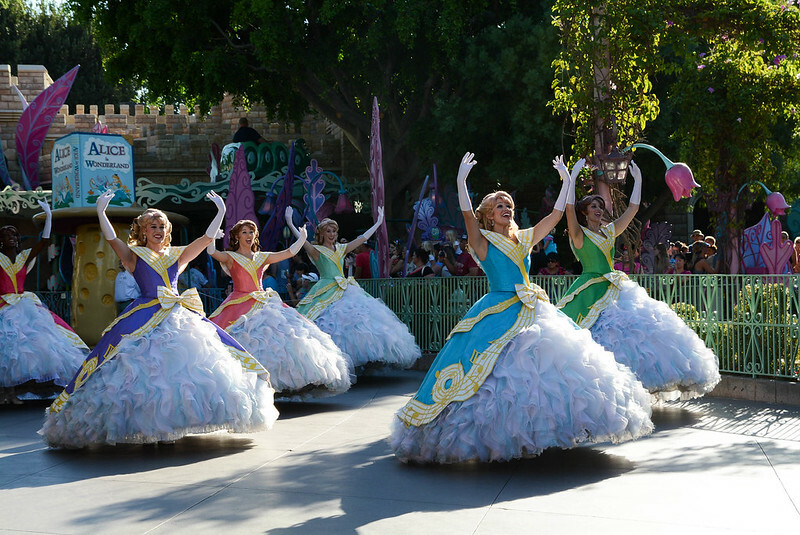 The cast members said that they allow an extra hour of meet and greets just in case the lines really get backed up during the party. I didn't get the fireworks photos I wanted, but I didn't carry my tripod around all day for nothing! 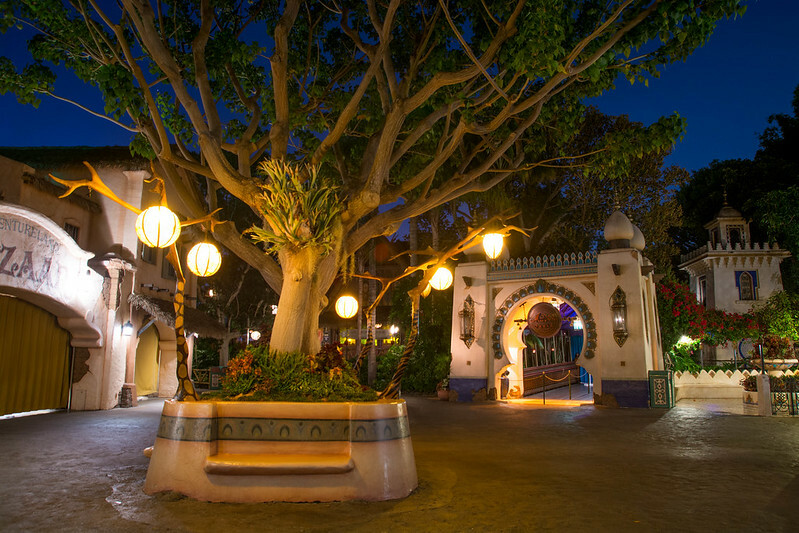 I decided to hang around the park and take the opportunity to get some long exposures. 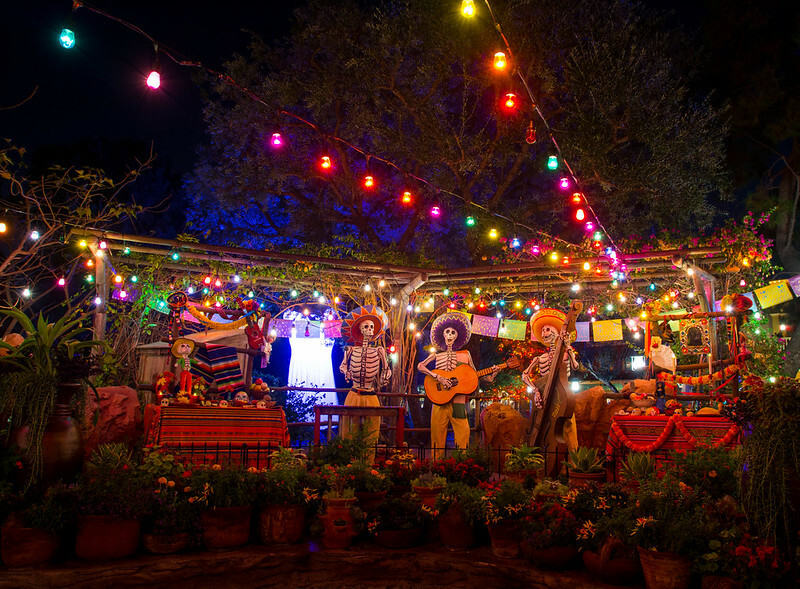 Perhaps my favorite Halloween-themed area was the Dia de los Muertos decor in Frontierland. 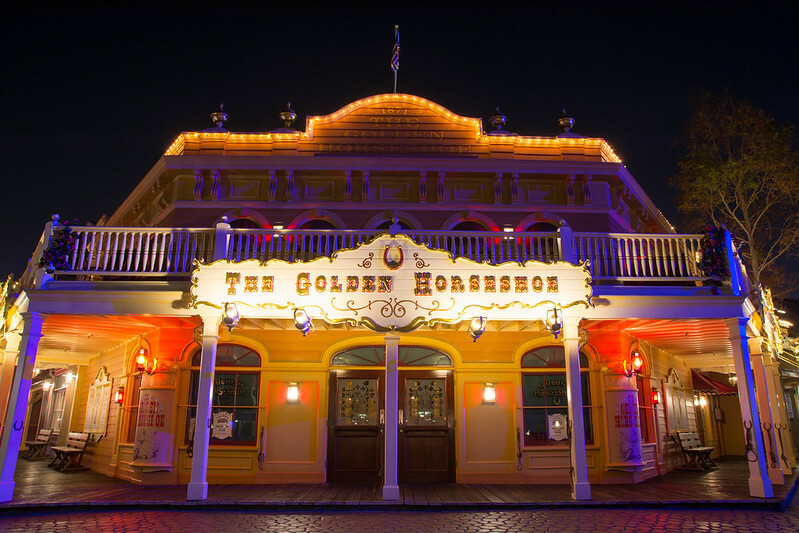 I really wanted to photograph New Orleans Square at night, but I ran into the cast members closing that part of the park. Next time! 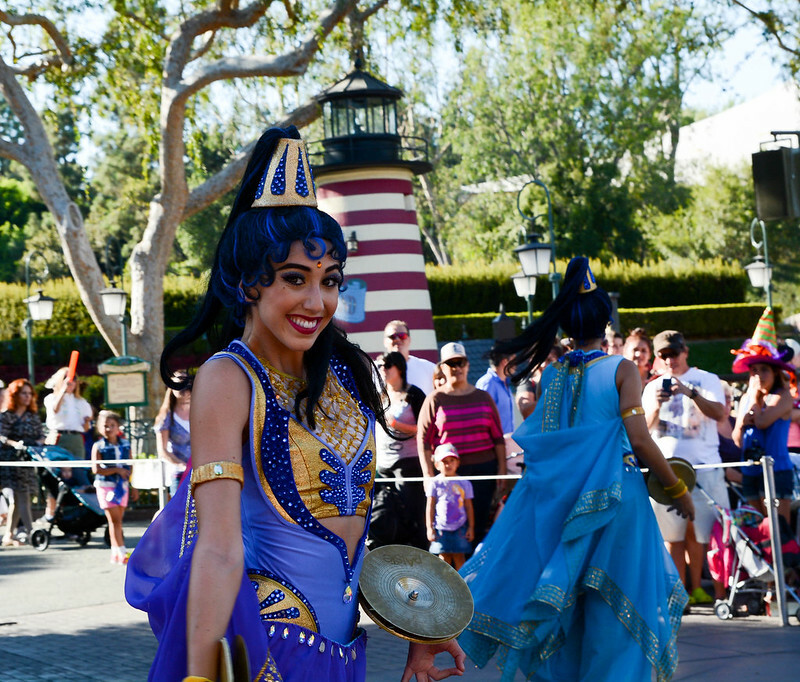 I was pushed towards the castle hub by the cast members and security guards slowly roping off lands. There were several other photographers with tripods enjoying the late hour to take long exposures. We were all very respectful of each other and would wait turns for certain shots. 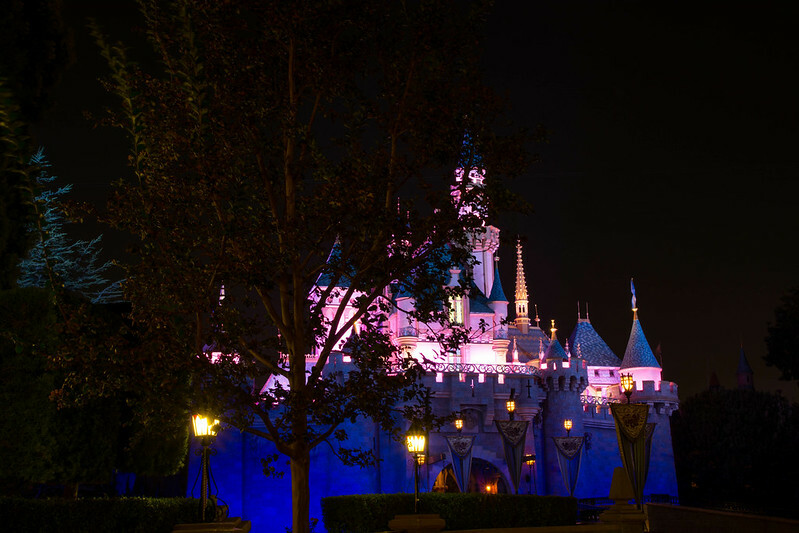 The lighting on Sleeping Beauty's Castle returned to normal... and I was disappointed to see that Disneyland has the same blue color lighting that they use on the Beast's Castle in New Fantasyland at Magic Kingdom. 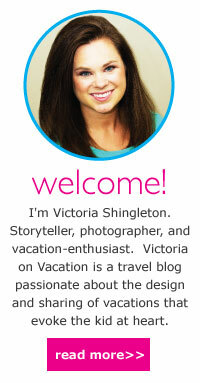 I had to do a good bit of color correcting in post-process to restore the pink! 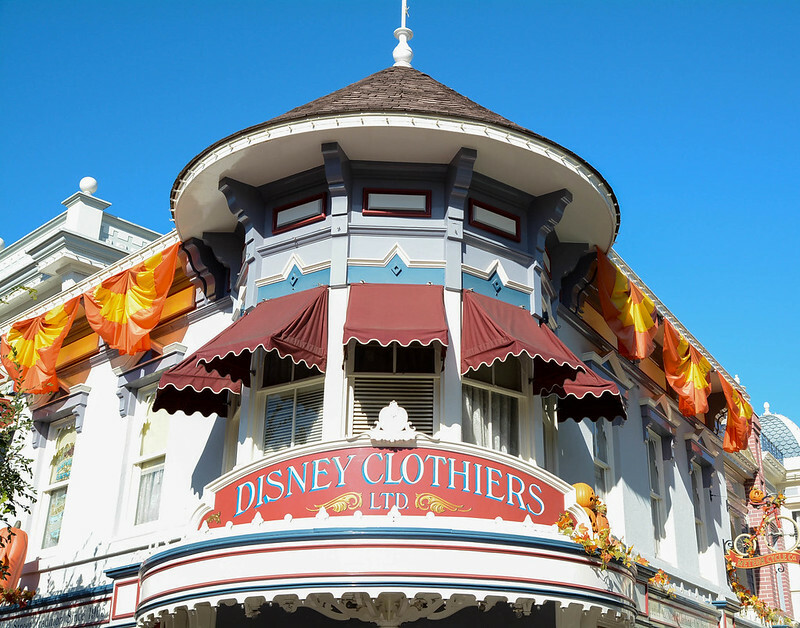 I wanted to get a few more Main Street photos, but there was a small crowd of guests towards the end of Main Street still shopping. 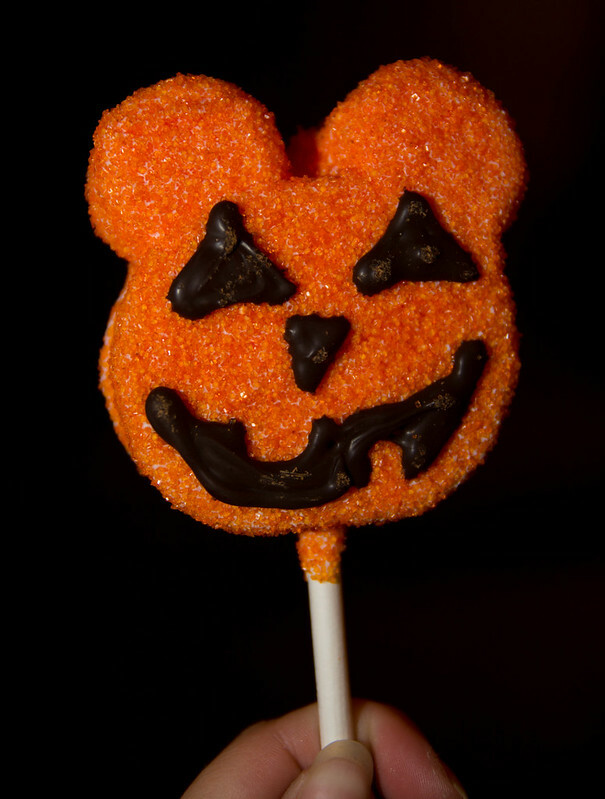 So I stopped into the Confectionery and picked out a Halloweeen-themed Mickey Mouse cake pop. It was very yummy! 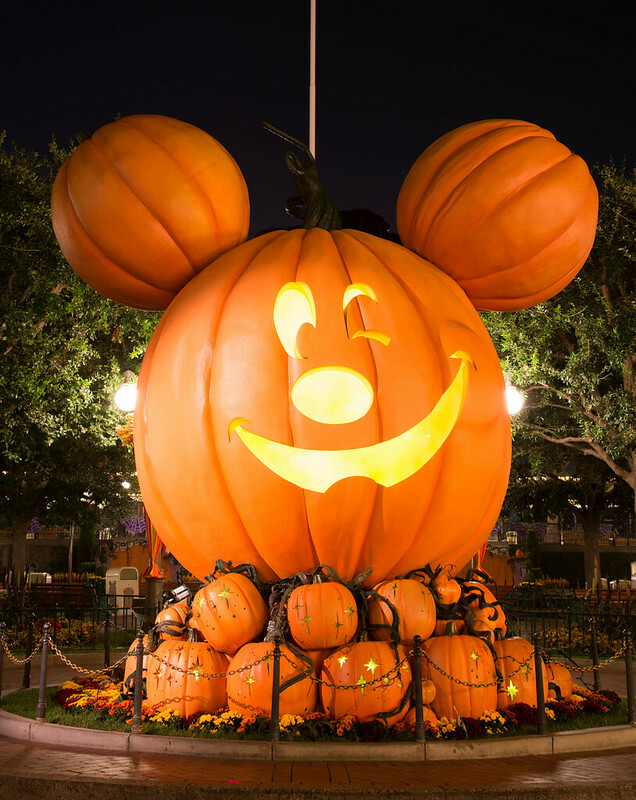 I really wanted a shot of the giant Mickey jack-o-lantern at the front of the park, but there were other guests gathered around it, taking advantage of the last-minute photo op, and also just sitting on the curb. 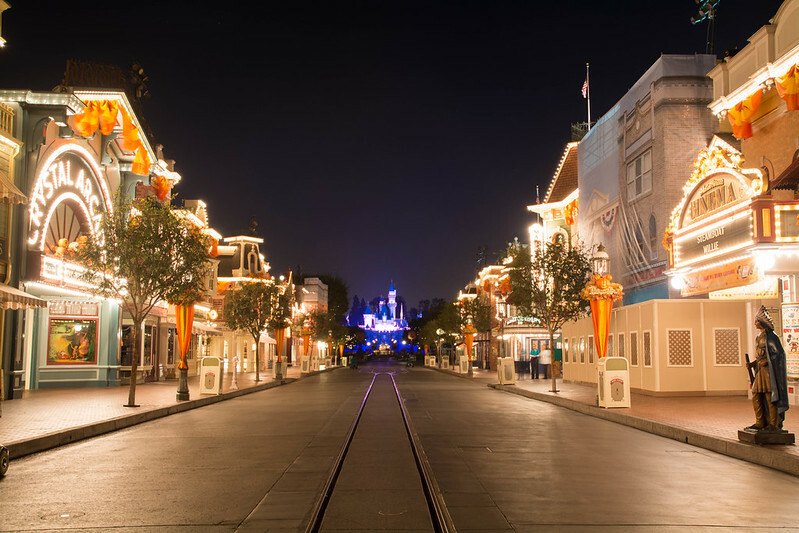 A shot worth taking is a shot worth waiting for, so I patiently stood on Main Street, waiting for the people to leave. Soon, four security guards stopped short behind me and made a line across the street. 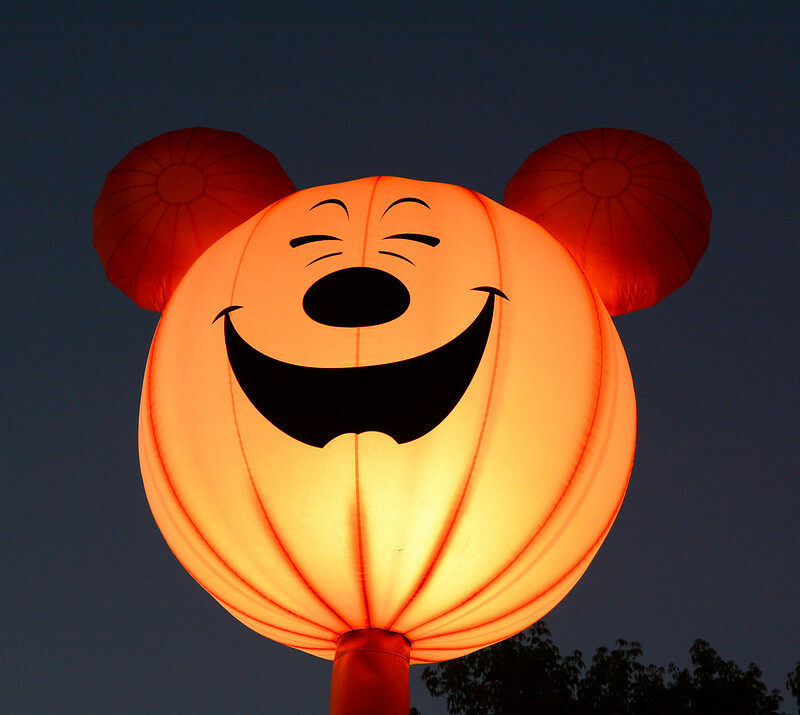 We started talking, and I told them that I just wanted to get a final shot of the Mickey pumpkin. "Without any people?" "Yes - no people!" "Okay, I'll try to make that happen for you." 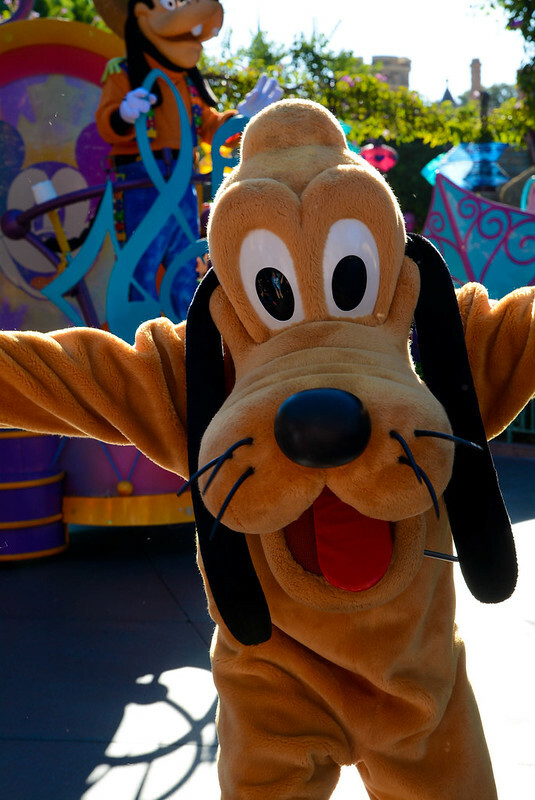 One of the security guards moved forward and started reminding guests that the park was closed and wishing them a safe drive home. I took the cue and set up my tripod. The first few people he told got the hint and left immediately... then he approached two ladies sitting on the curb. "But we don't want to leave." They wouldn't get up. 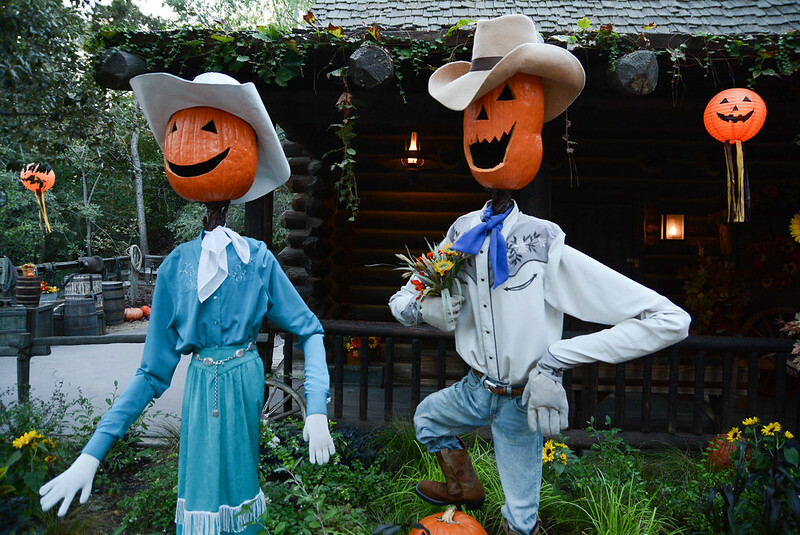 He continued to make small talk with them and slowly pulled them away from the pumpkin! 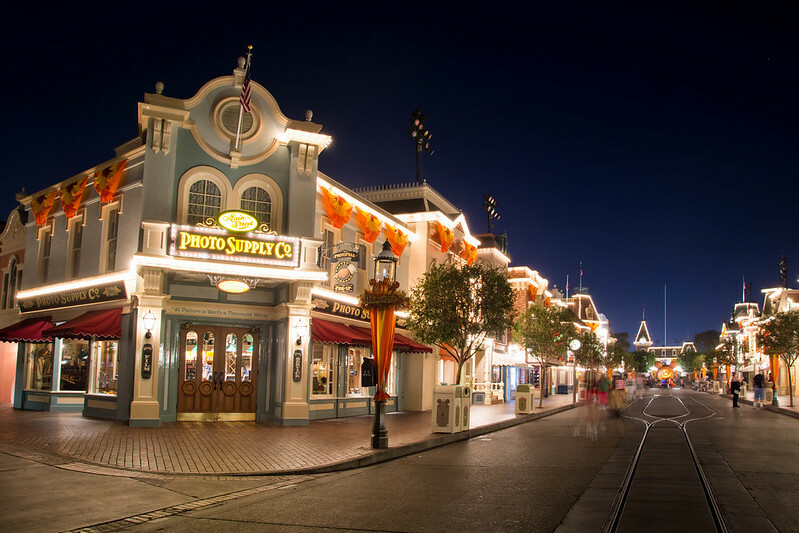 Then I noticed that security behind me had moved, so I turned around and got an (almost) empty shot back up Main Street. I was the last car on my level! 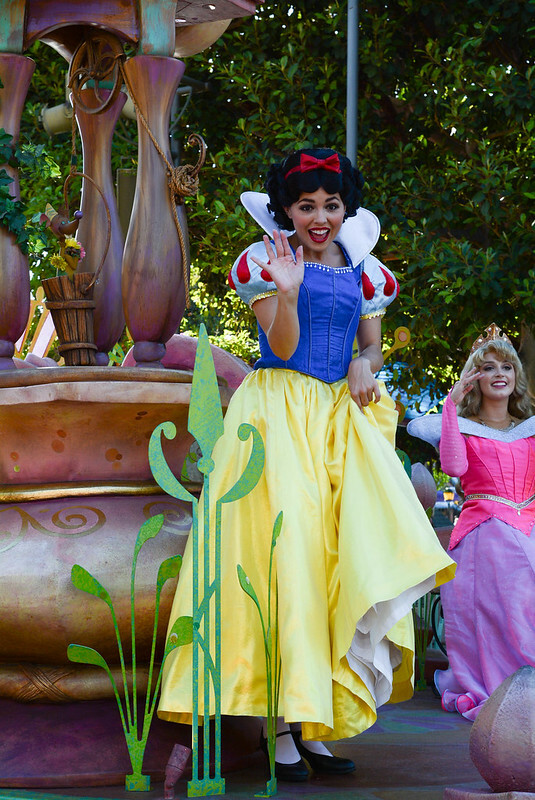 That's when you know you've made the most of your day at Disneyland! 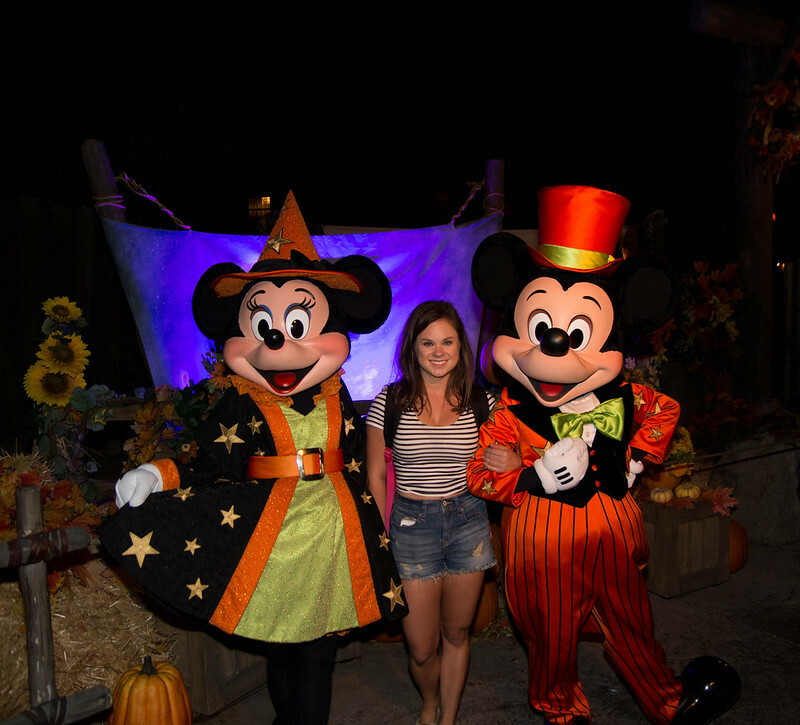 As a day guest, I enjoyed Mickey's Halloween Party. 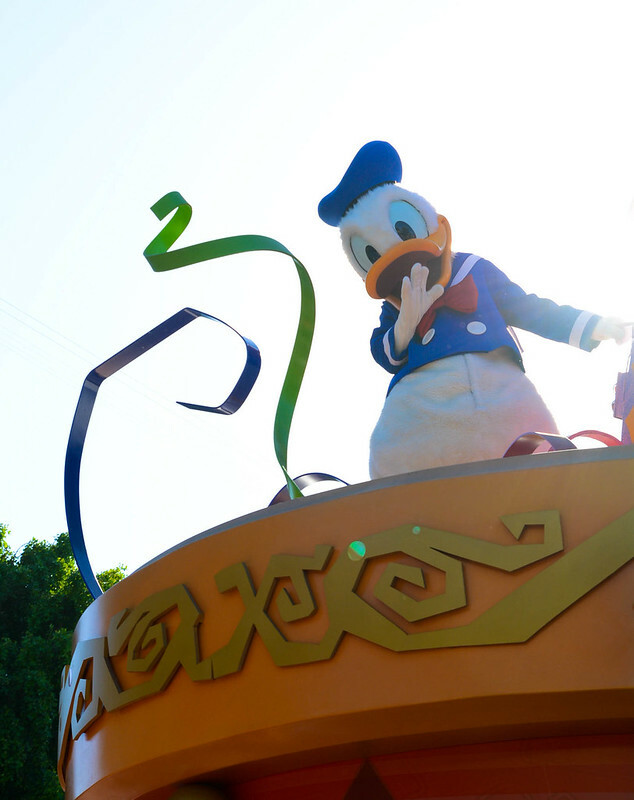 However, I'm not sure if it's worth the additional ticket for guests with multi-day passes. 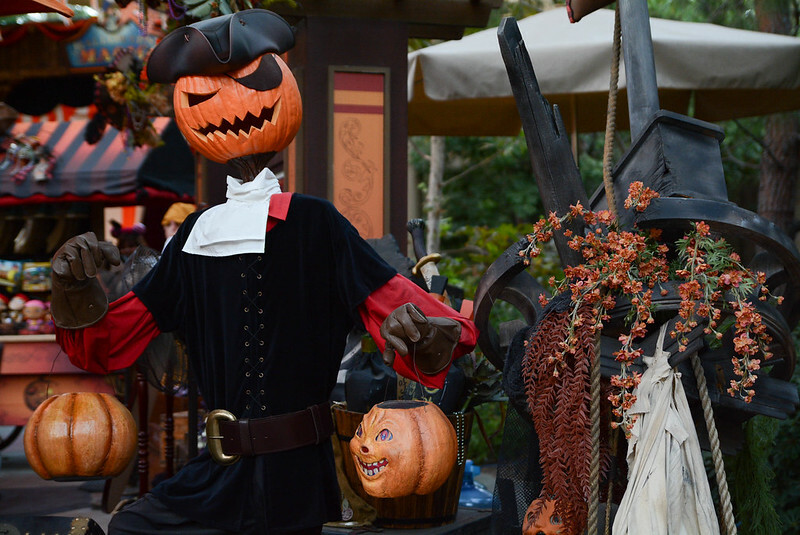 A lot of the Halloween decoration can be seen during the day, as well as on nights when there is no Halloween Party scheduled, though there are some special effects that are exclusive to the party (fog over Rivers of America, spooky lighting around Big Thunder Mountain). 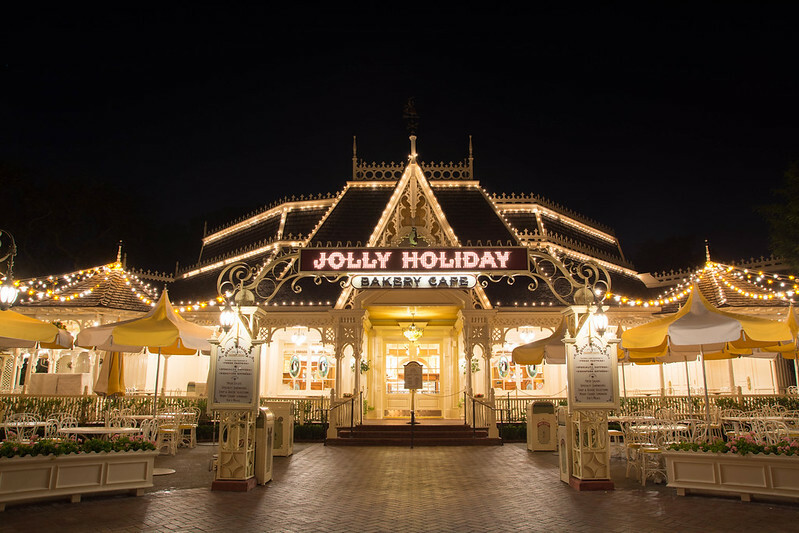 There are special meet and greets with Disney Villians and Jack Skellington & Sally, so the party might be worth it if you enjoy collecting photographs with rare and event-exclusive characters. 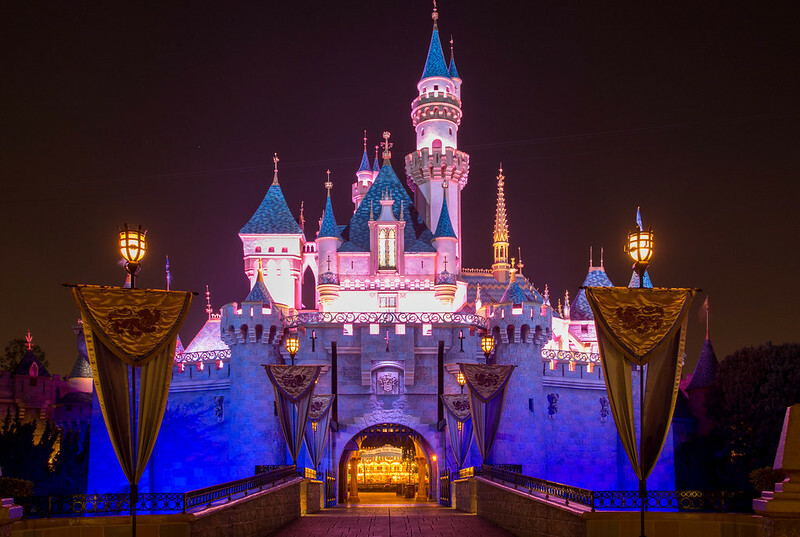 As for entertainment, it seems that Disneyland offers less than Magic Kingdom. 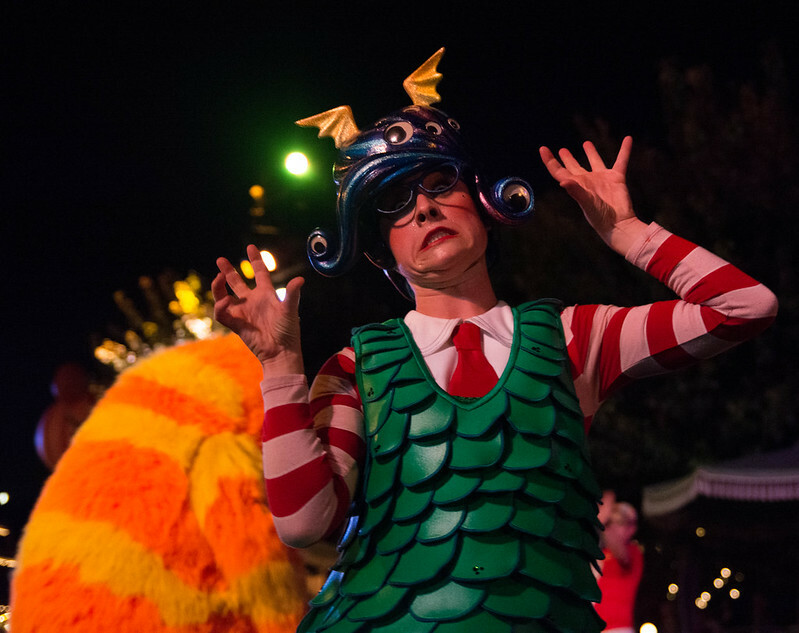 There is a Monsters U Dance Party (I believe MK offers three dance parties throughout the park). 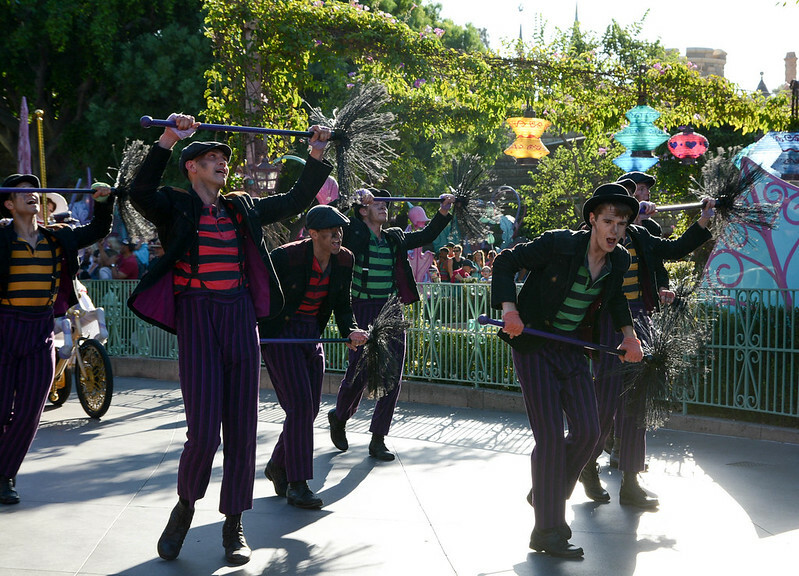 What I saw from a distance and enjoyed was the Cadaver Dans, a ghoul quartet floating on the foggy Rivers of America. 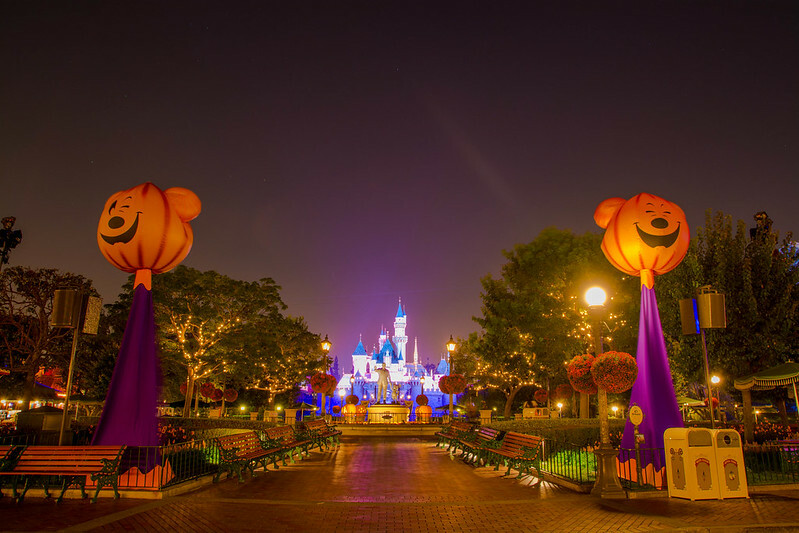 The biggest appeal to the Halloween Party for guests who already have multi-day passes is probably the Halloween Screams fireworks show. 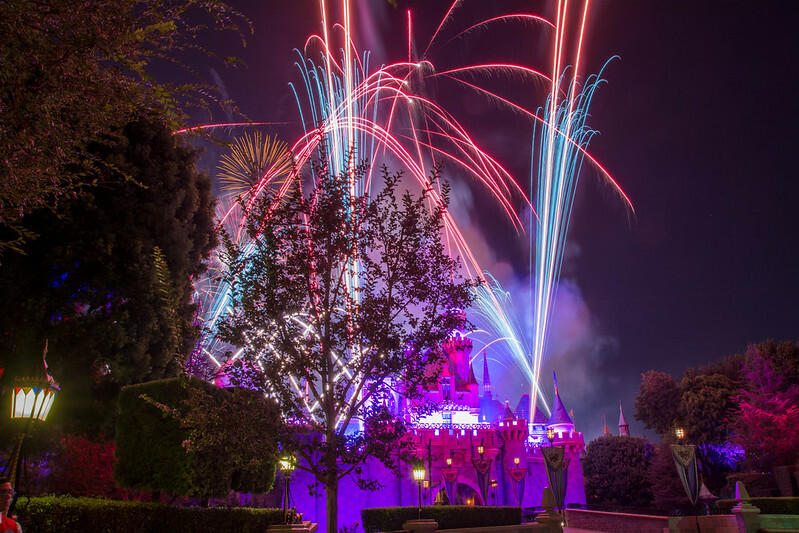 While I did enjoy the fireworks show, I feel that it's a bit unfair because I don't have a recent experience of the everyday Disneyland fireworks show to compare it to. 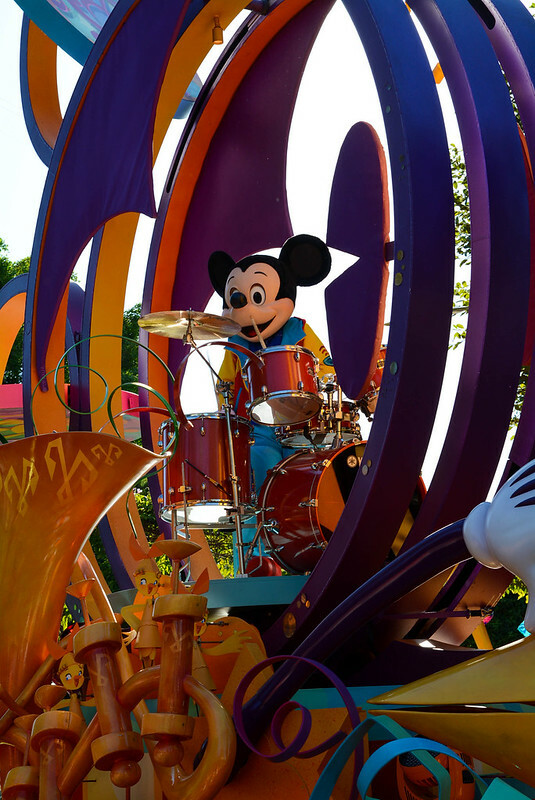 When putting it beside fireworks at Walt Disney World, it's not nearly as large of a production as the nightly Wishes fireworks, and I feel it is more contained, but perhaps more interesting musically than the Not-So Scary Halloween Party's HalloWishes. 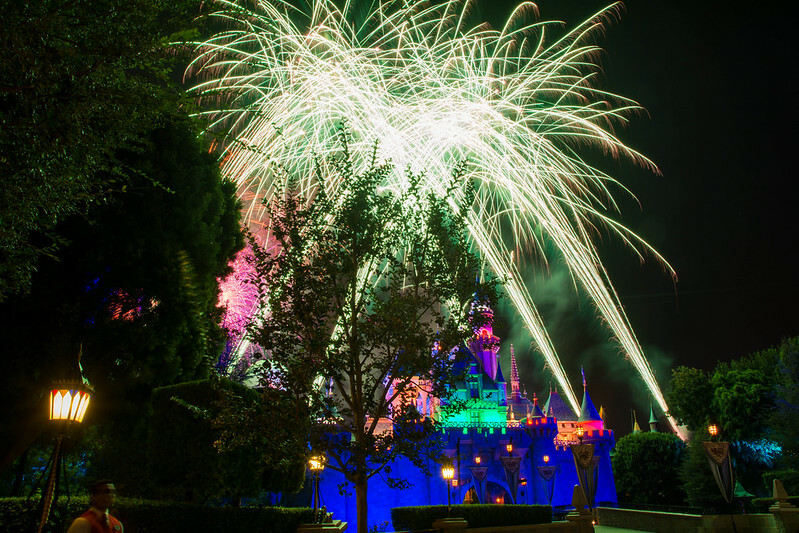 What is unique about Disneyland's fireworks is that there are a lot of bursts coming right from the castle. 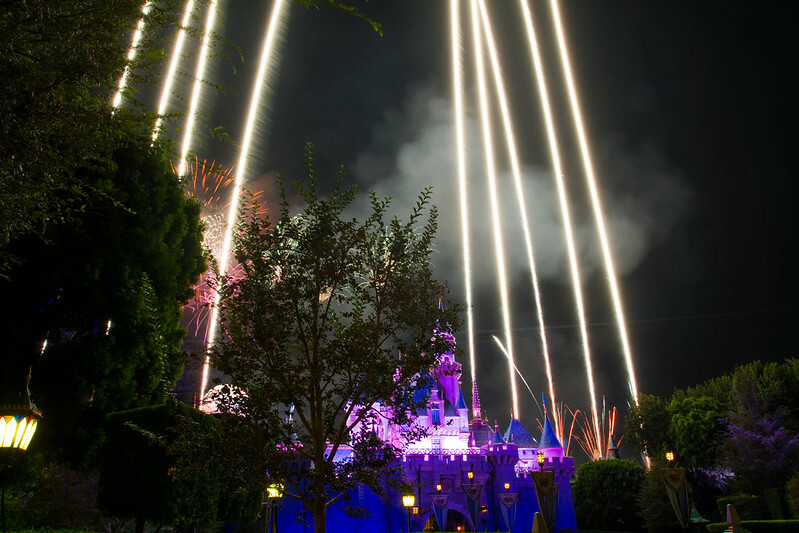 I also felt like the fireworks were being shot off from a location much closer to the park than in Magic Kingdom. My viewpoint was a little disappointing because of the trees which really limited how many of the fireworks bursts I could actually see. 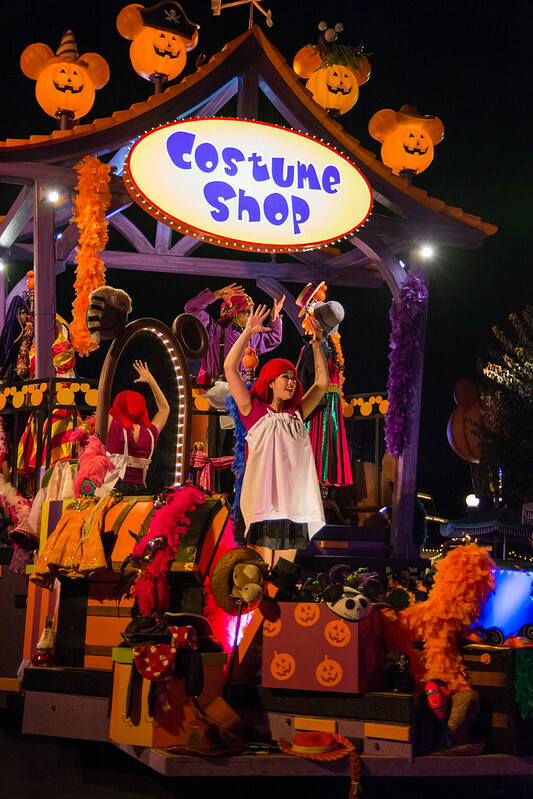 Finally, I already discussed my overall disappointment with Mickey's Costume Party Cavalcade and how it is seemingly targeted at children. 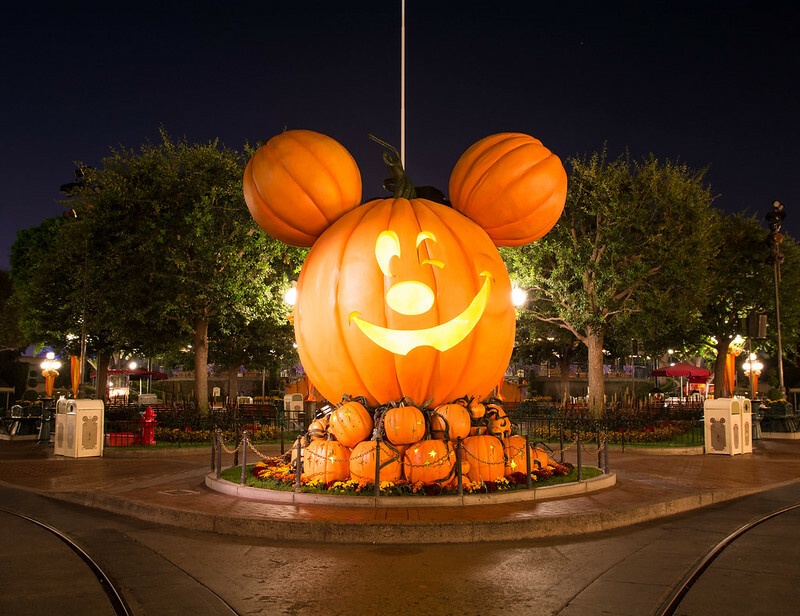 My thoughts are that there are a lot of really scary Halloween events at theme parks in the Los Angeles area - Universal Hollywood Horror Nights, Knott's Scary Farm, and Fright Fest at Six Flags Magic Mountain. 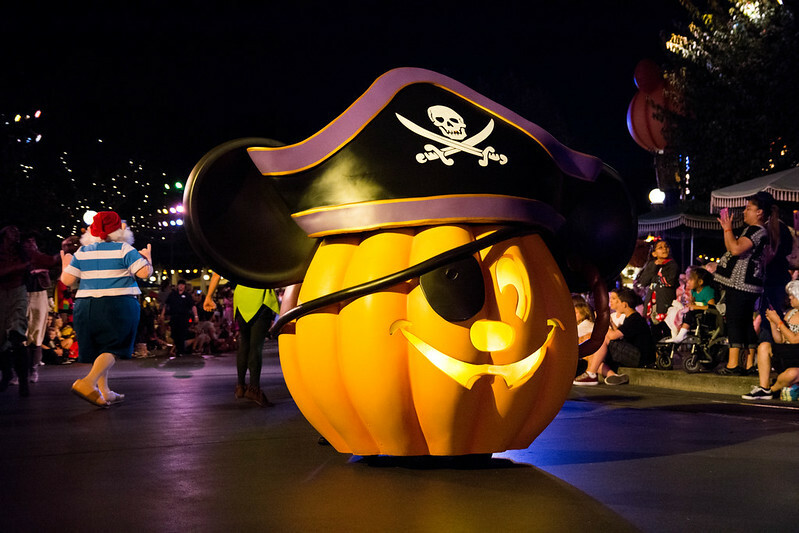 Honestly, I'm surprised that Disney didn't jump on hosting a family-friendly Halloween event much earlier - Mickey's Halloween Party began in 2012, while Magic Kingdom hosted the first Mickey's Not-So-Scary Halloween Party in 1995... 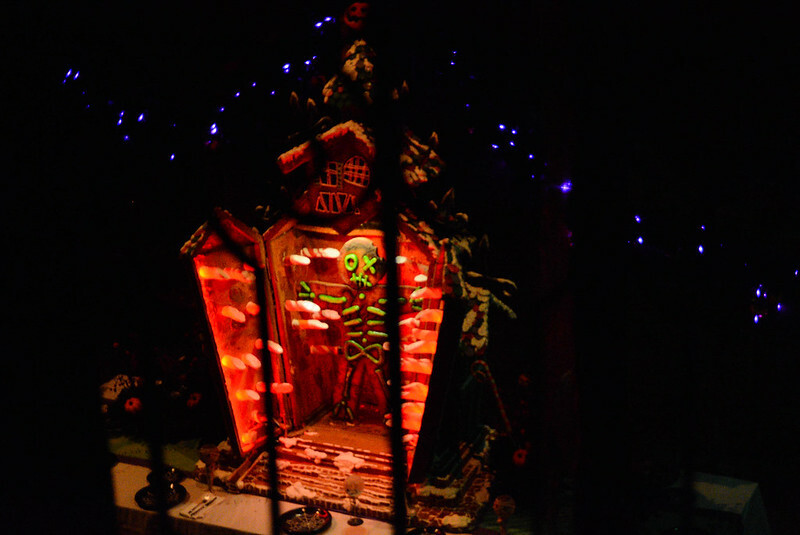 Even Disneyland Paris started hosted its own version of a Halloween Party in 2008! 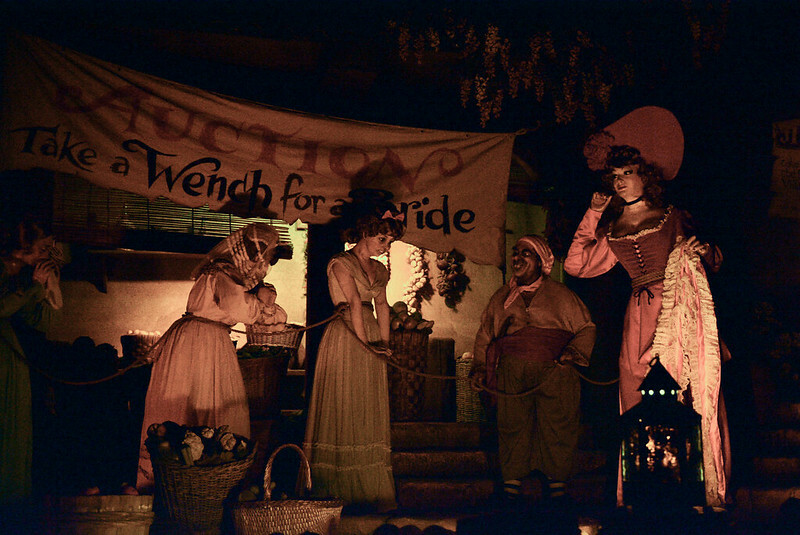 So I suppose that I should keep in mind when I compare the Disneyland Halloween Party to the Magic Kingdom version that it is 17 years behind in development! 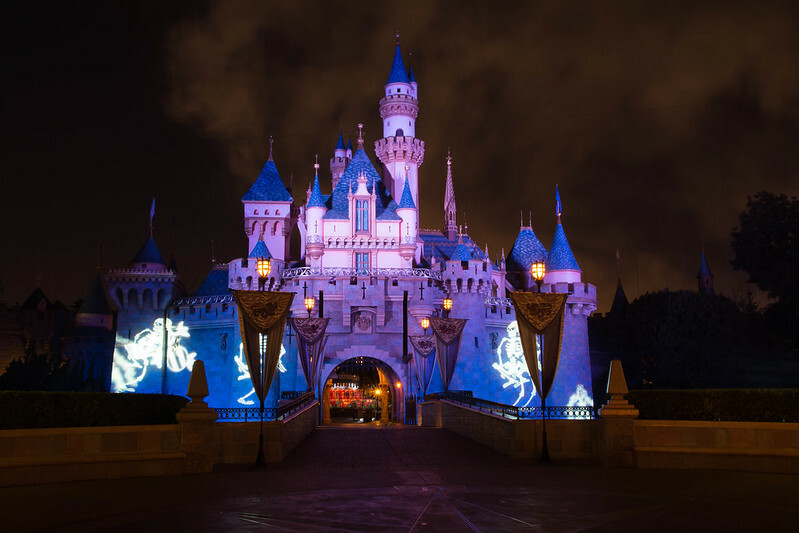 Disneyland is providing a family-friendly Halloween experience in Southern California... why didn't this happen sooner, and why aren't they spending more money on its development? 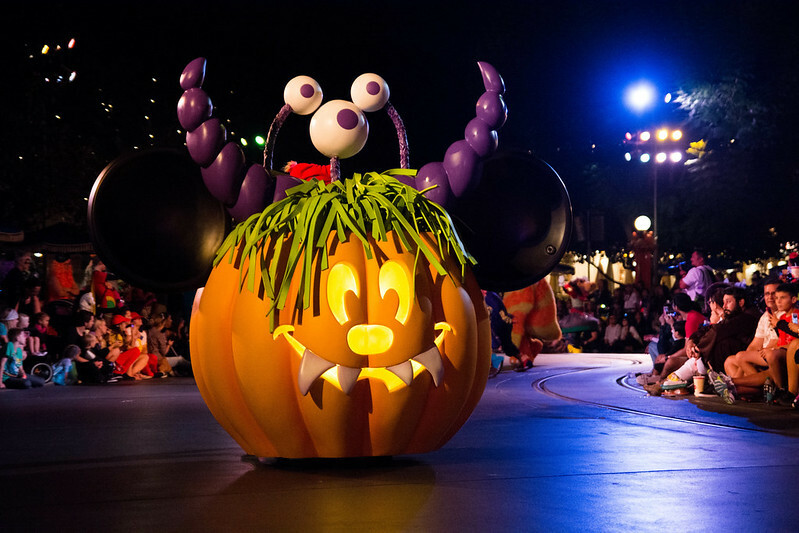 Mickey's Halloween Party occurs on select weeknights during September and October (and is currently sold out for all dates in 2014 except for Wednesday, October 29). 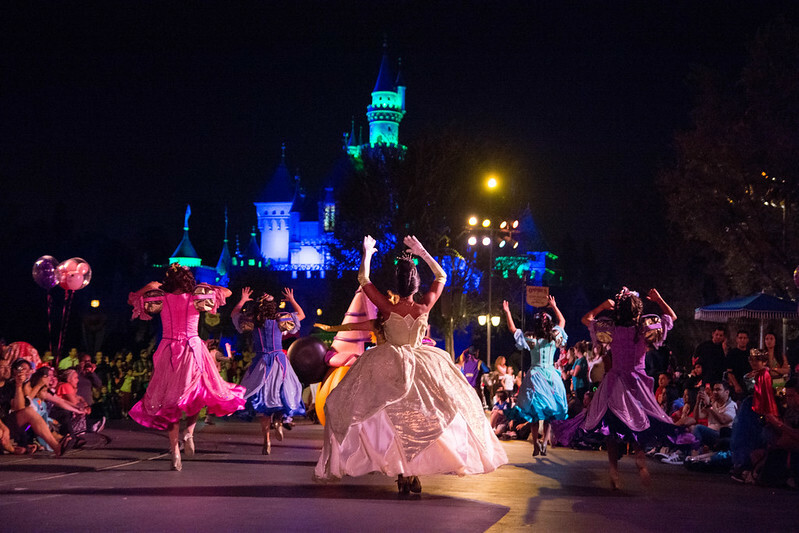 To purchase tickets, visit Disneyland's Special Events Page.